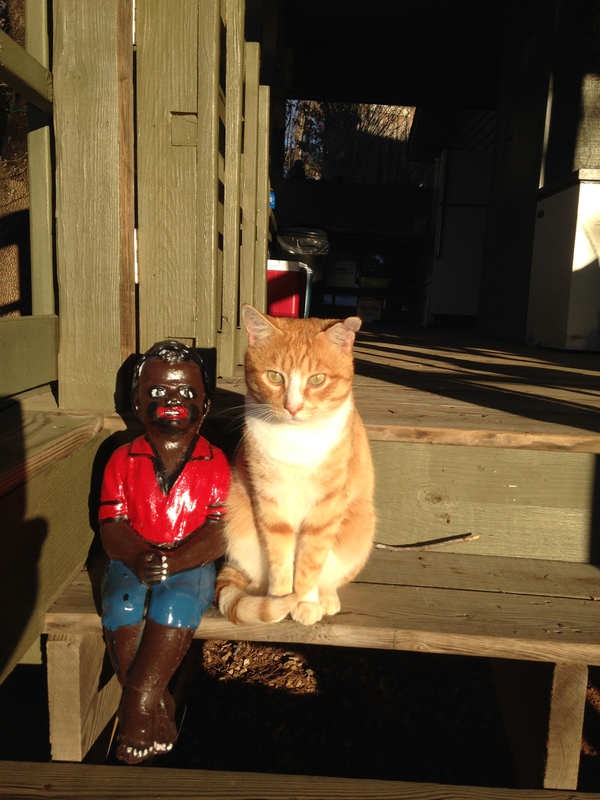 a cat wandered up…. 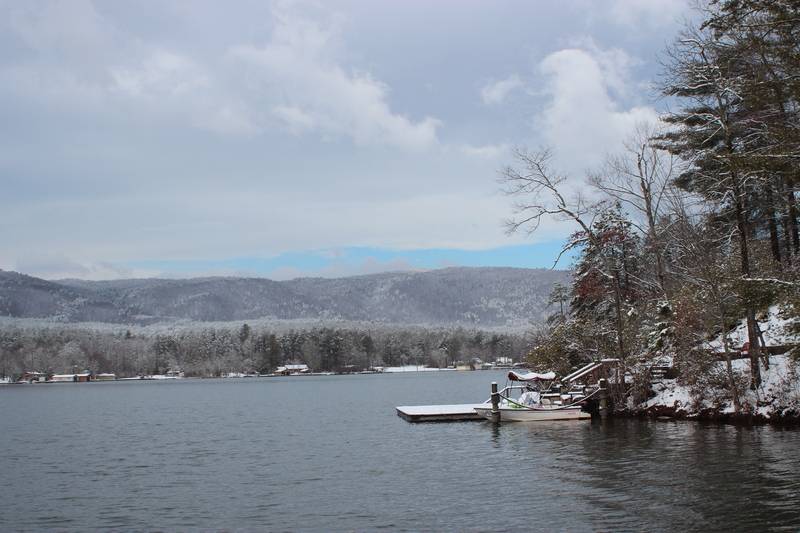 other than that it’s been a quiet winter in the foothills of South Carolina. More often than not it was comfortable weather, the frigid weather held back until the first part of January – then we got a dash of it! Within it all I have nothing to complain about – i didn’t have to pull out my ‘jong-johns,’ the pipes didn’t freeze, and nothing broke. Another month, another set of bills – seasons’ pass, and another sunset hits the mountains; ‘Life’ is good. 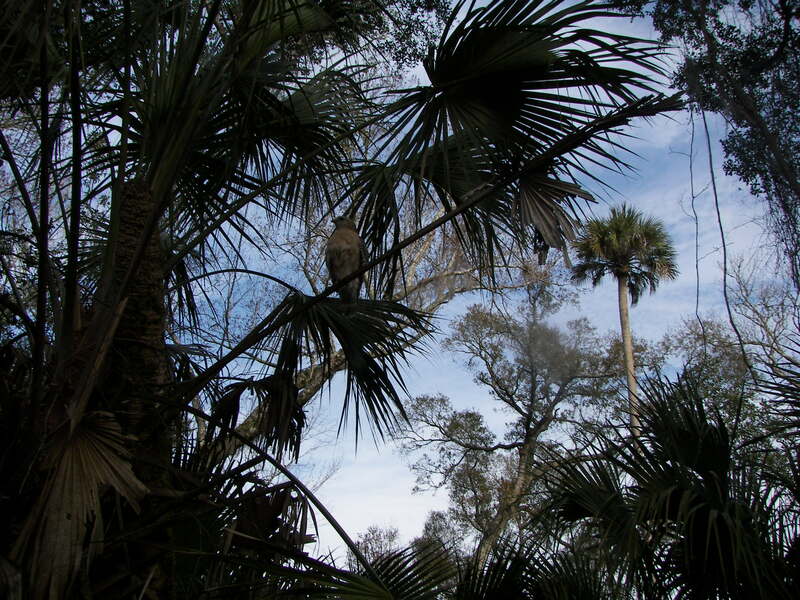 In this rotation is February – a time to trade any sense of ‘cabin-fever’ for another snowbird ‘loop’ through Florida – my homestate. 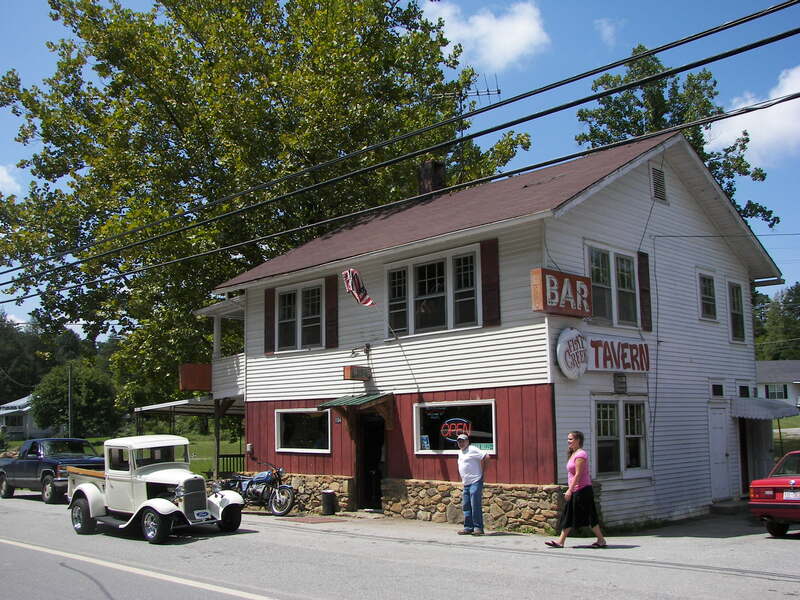 It’s ironic growing up hating tourists because of their impact on our little town, and now having an “R-U-V!” But at at this time also (life at 60 ) it fits, so well, why not? 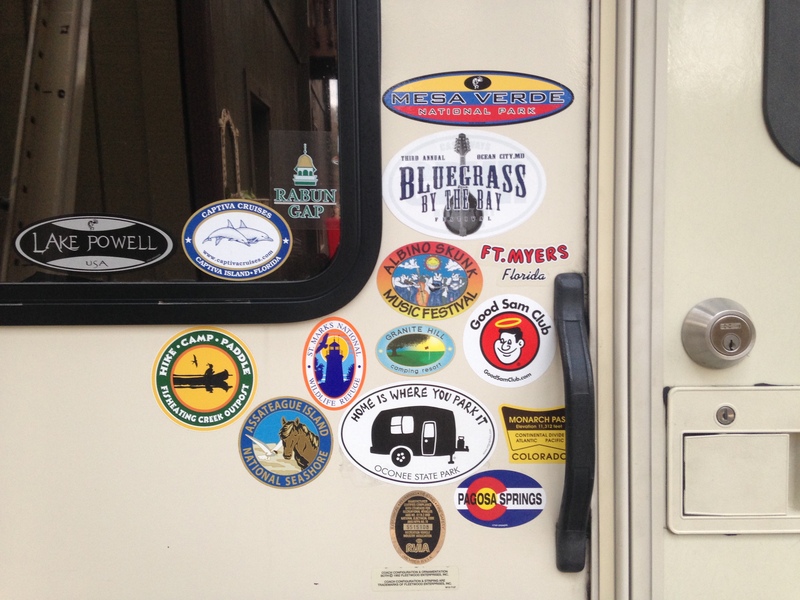 btw; one of the GK’s (James) calls our RV an R-‘U’-V, James is a pretty smart guy, so with this our ‘Little Bessie‘ is now considered a first class “R-U-V!”. 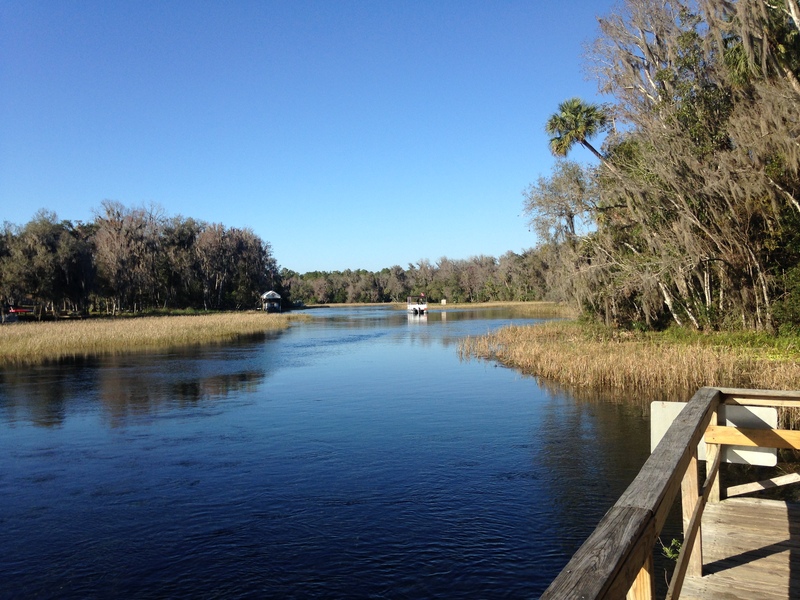 On last year’s ‘loop’ I wanted to ride the backroads of W Georgia to Florida; long story short – it didn’t happen (‘fluid’ decisions). We stay off of the interstates as much as possible; this year in the direction of South Georgia and Plains, Ga – home of Former President Jimmy Carter. I always liked this guy – still do, he’s a good man. 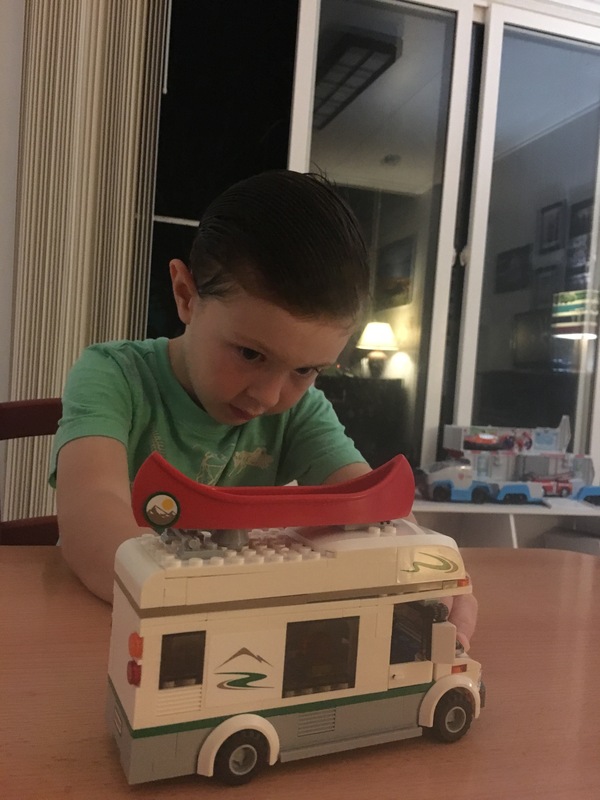 So we spent the day ‘lolly-gagging’ around the town stores and finding out first-hand just how much he is thought of as ‘a friend’ and neighbor. He has a lot of friends. The old brick elementary school he attended has been preserved by the National Park System, really nice – and a place where the halls can easily remind one of where real ‘friendships’ begin. The above picture was on the wall – I liked the character and took a picture of it. Sometime in the night Otis came out of his nest, looked around – then curled up and went back to sleep. Kims done a good job training him.. His eating/cat activities were normal with no messes. 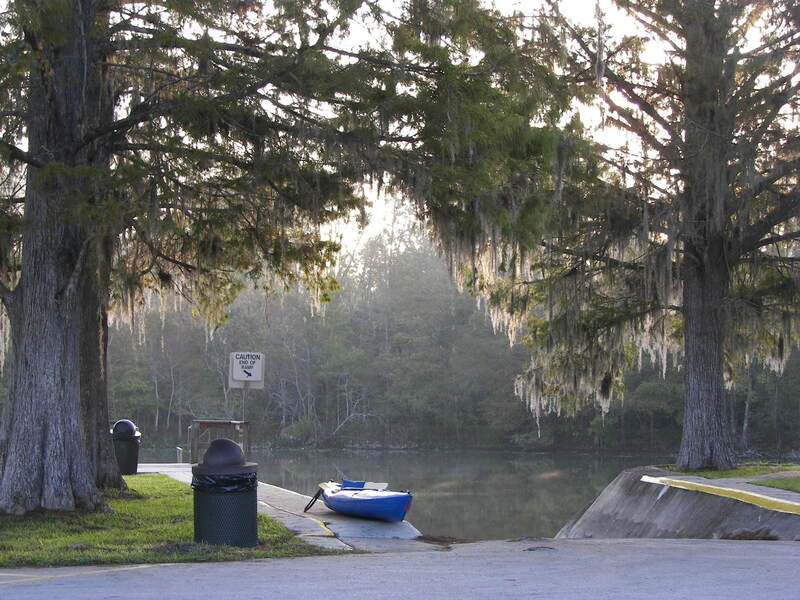 When morning came we continued southward on Ga Highway 19 into Florida with a stop at Fanning Springs. 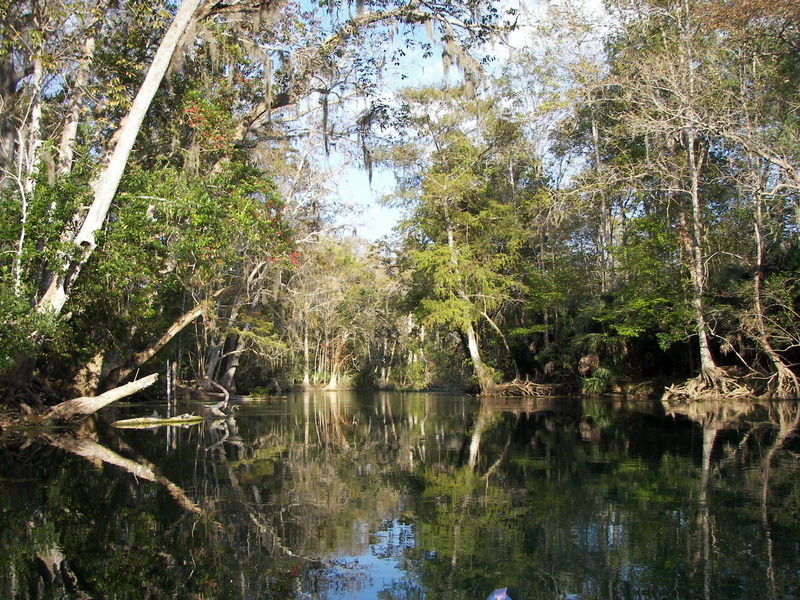 Fanning Springs is a clear spring along the Suwannee River that I’ve paddled through several times – and it was a good time to show Kim where’d I been the past several years. 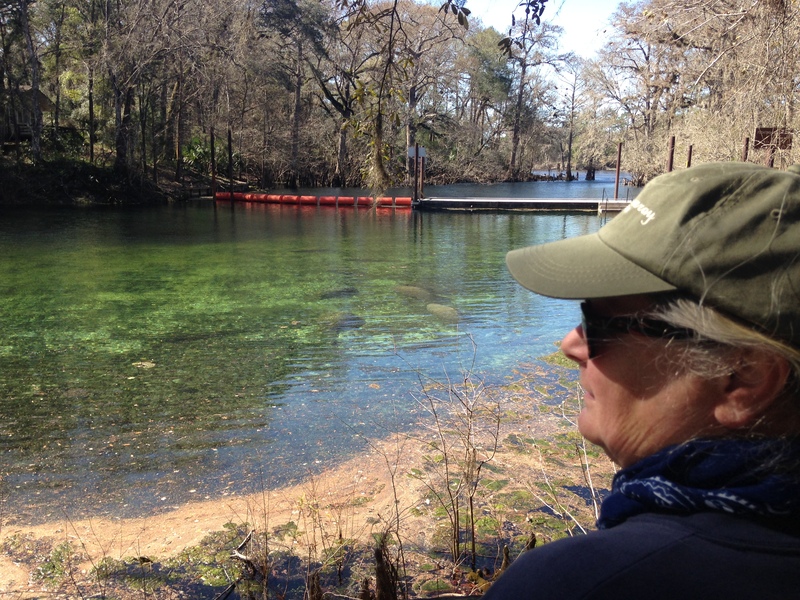 I was really hoping for Kim to see some Manatees, and surprisingly we found 6 or seven ‘lazing-around’ just below the clear spring waters in the thin February sunshine. Next stop along the way was to see an old friend, Dan Goddard (FMHS 70). I’m a ‘drop-in’ kinda guy, and Dan is always good with it. 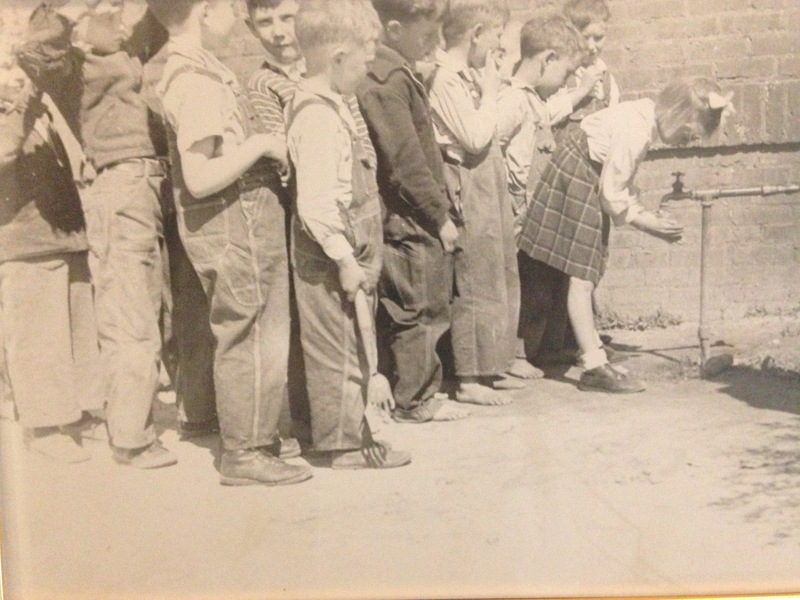 A schoolmate, we chatted as we walked through his back-yard (‘bone-yard‘) of old-cars and rusty projects – I’m into that stuff too; just don’t have a pace to put it – so I enjoy others stuff. 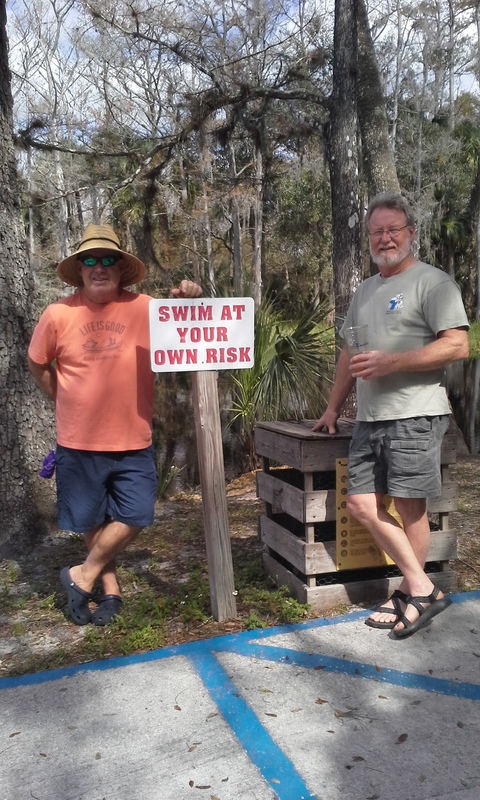 Old-friends are good; and after a mmmmeaty burger and a beer at nearby Willards with Dan – Kim and I were off to Rainbow Springs. 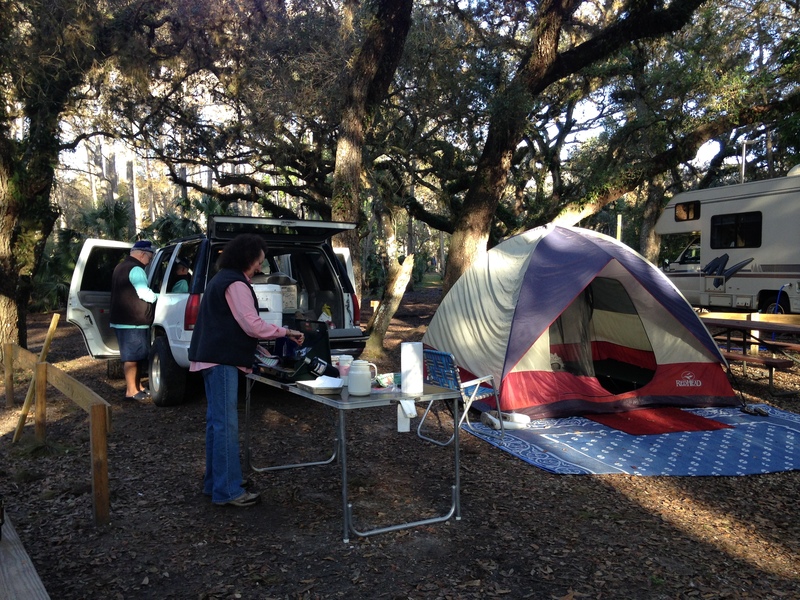 We had five days and four nights at Rainbow Springs State Park waiting. 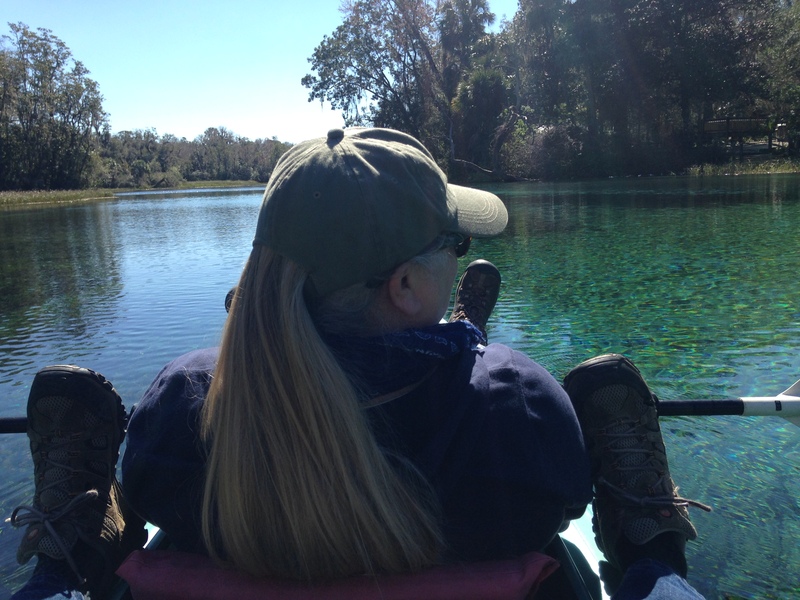 Long enough to get comfortable, and a good place to get Kim in a kayak – on the water. 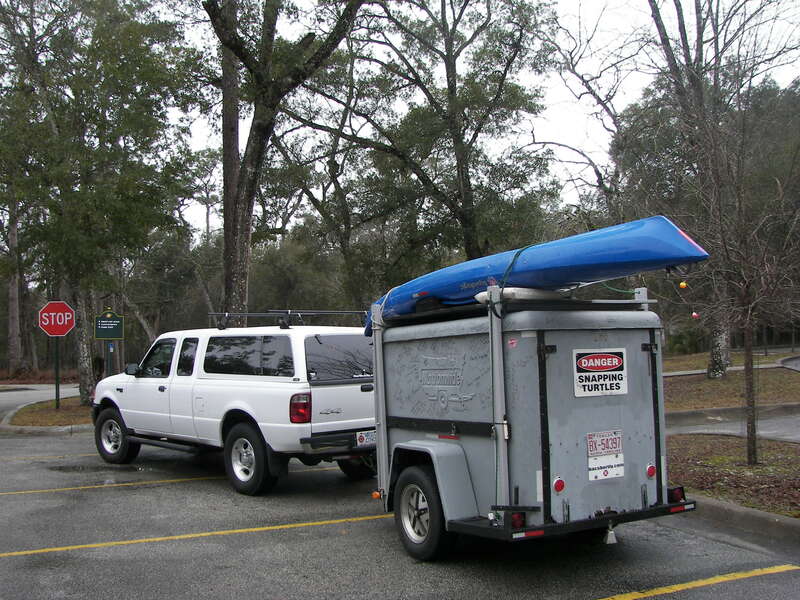 The North Carolina Carr’s gave us a tandem-kayak for use at the lake, and when Kim said she would get out in it; I threw it on the trailer (along with my solo) and took them both with us. 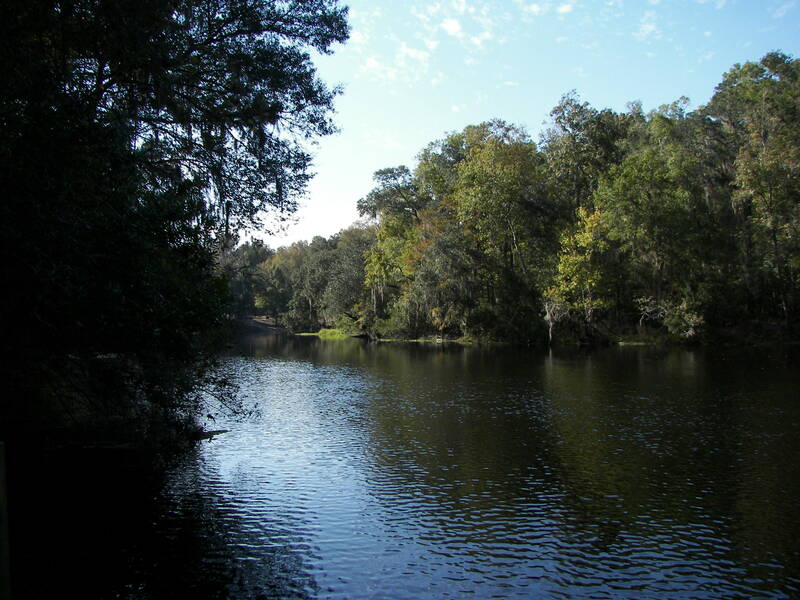 If I ever have another home; along the Rainbow river would be the place. 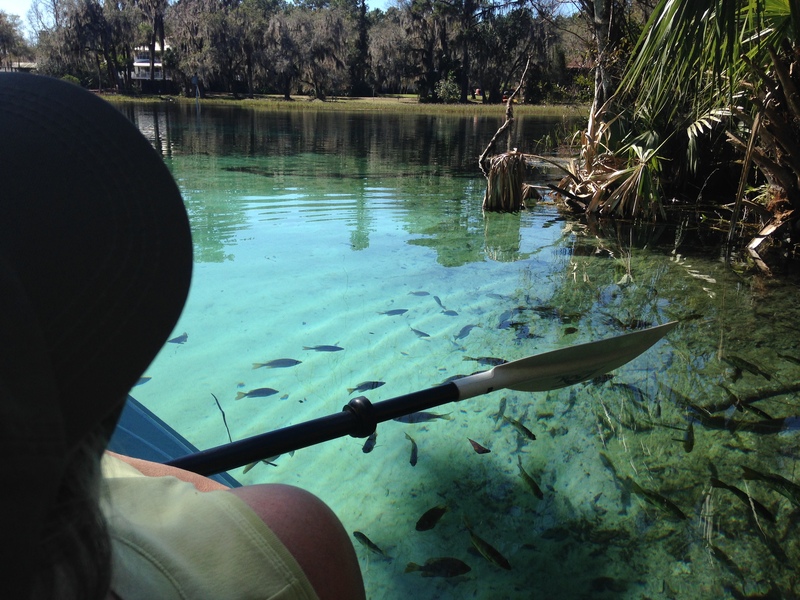 The place worked well for getting her introduced to a kayak, and I think she liked the clear water. 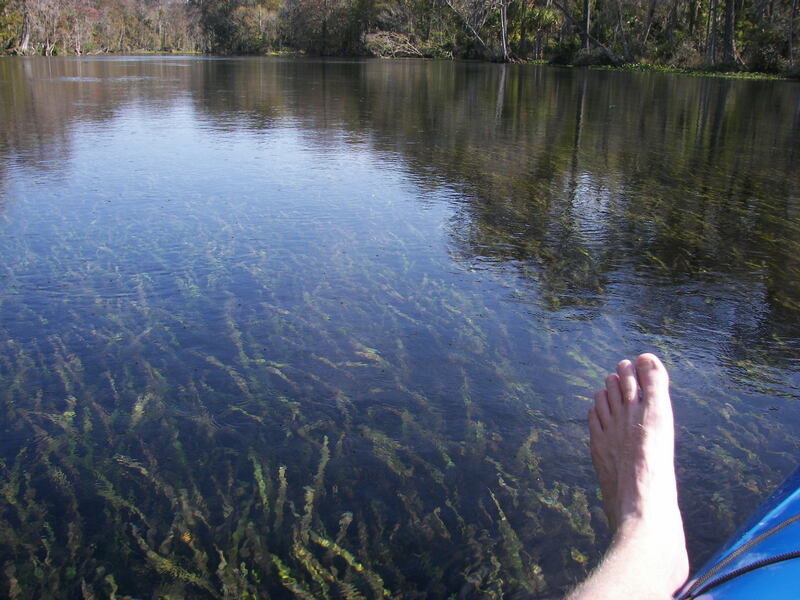 The Rainbow Springs ‘head’ is about a mile upstream, an easy paddle so we worked our way up river – then with our ‘feet-up,’ completed a very mellow hour-long trip back to the campground ramp. I was wondering if I could get her back in (kinda hoping not so I could solo) but I blew it when I mentioned there was beverage at the other end. 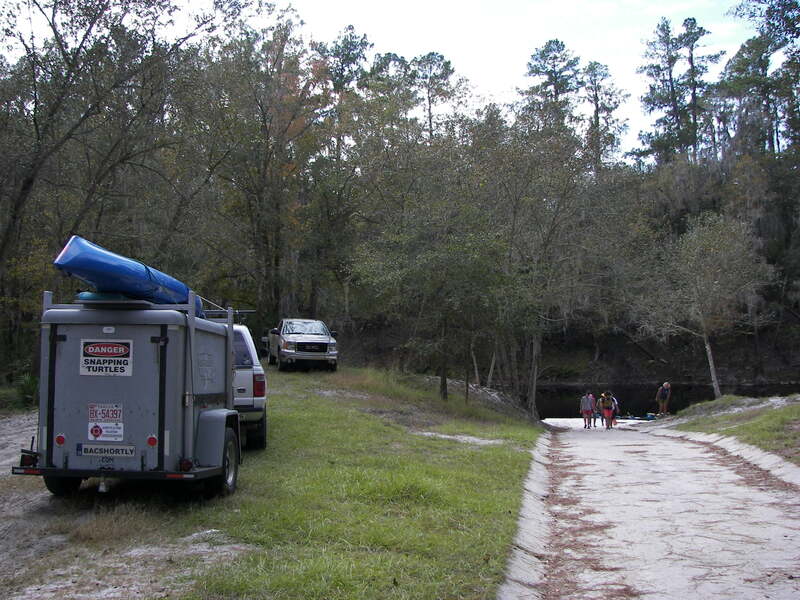 The following day we paddled (lightly) with the current a few hours down the Rainbow river to the Withlacoochee. 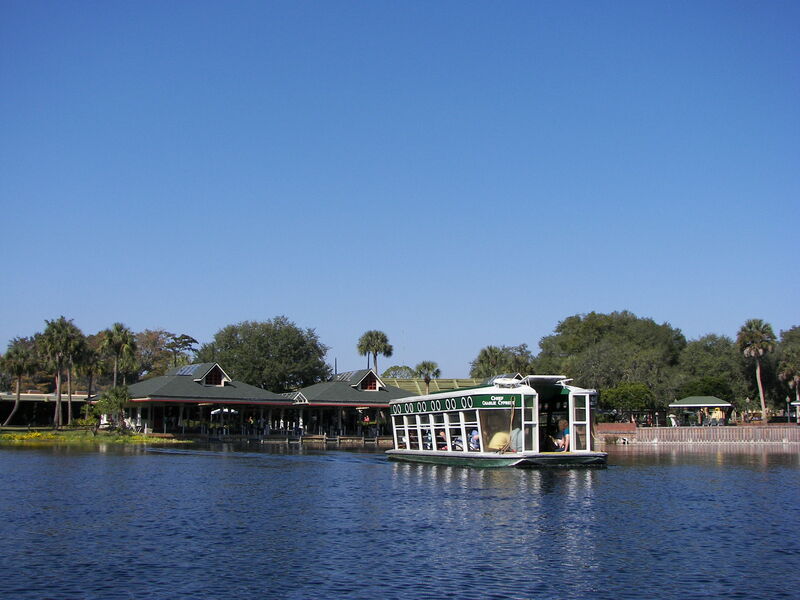 A little further from there was the Blue Gator tiki bar – and next door was a shuttle (at our convenience) back to the Park. – it is true, at the end of the Rainbow – was a cold little cup of gold. 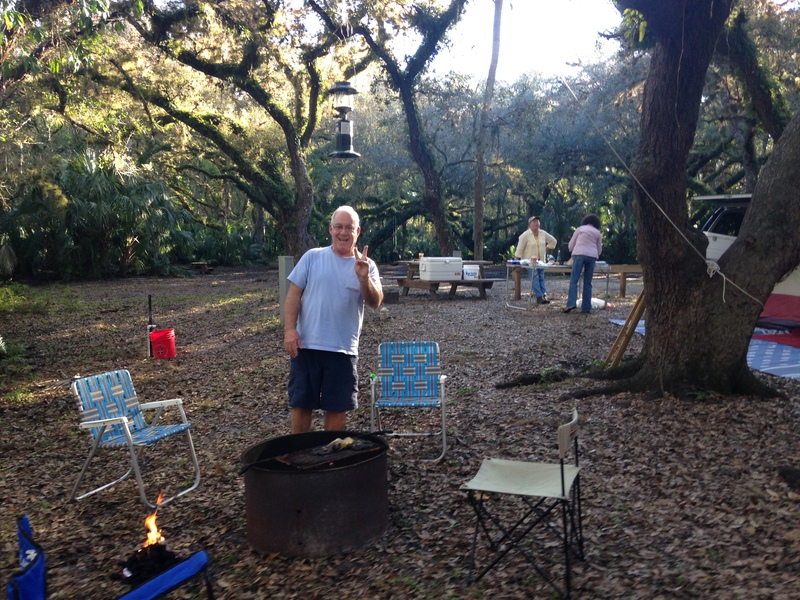 Oh yeah, and Otis – he figured right in to this park-life stuff. 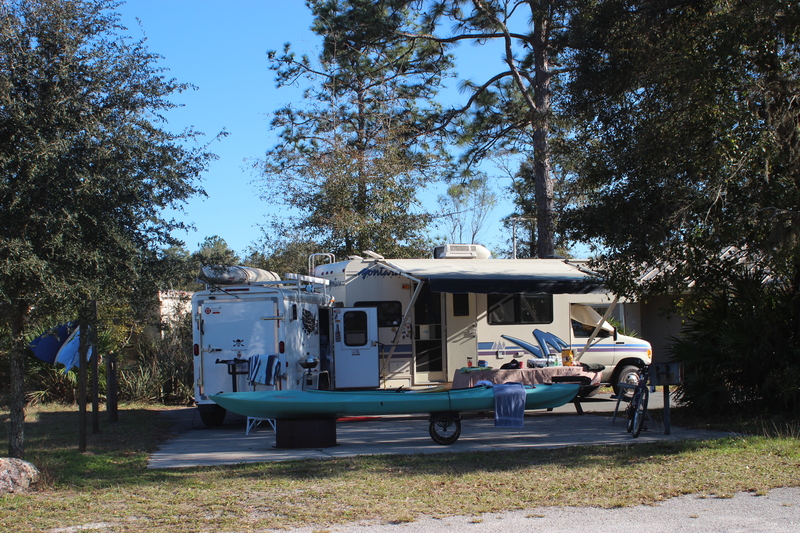 After a week at Rainbow, we hit the bacroads once again – down the road stopping to visit a cousin, Ellen (Lakeland/Kathleen is family land, Mom’s side). 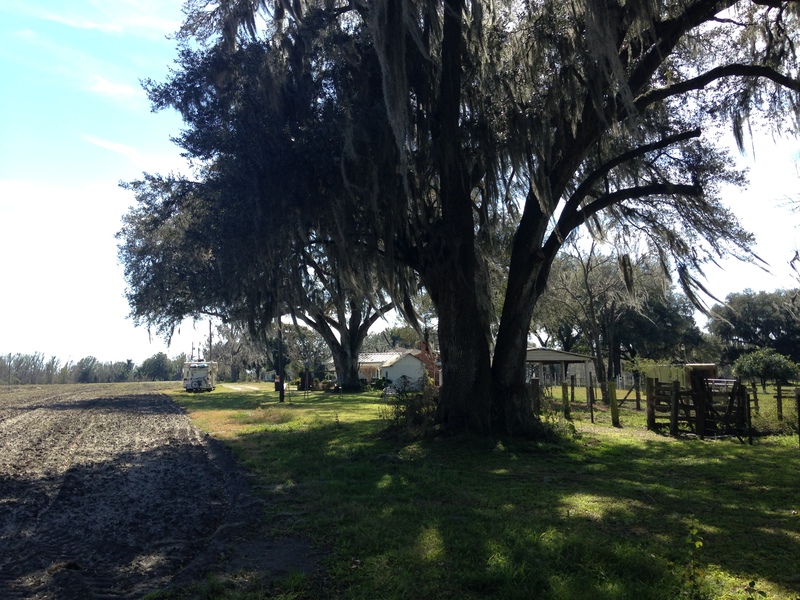 Ellen’s got a neat little place off Scrotum rd (Socrum rd) with just the right amount of livestock – and a little gator in her pond. 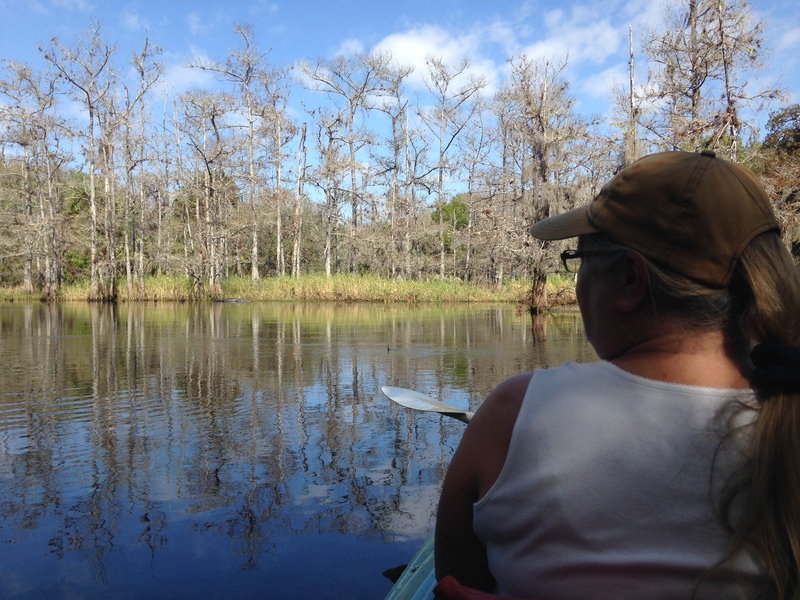 Julie, her daughter is the only female gator-trapper for the area and drops one off on occasion. 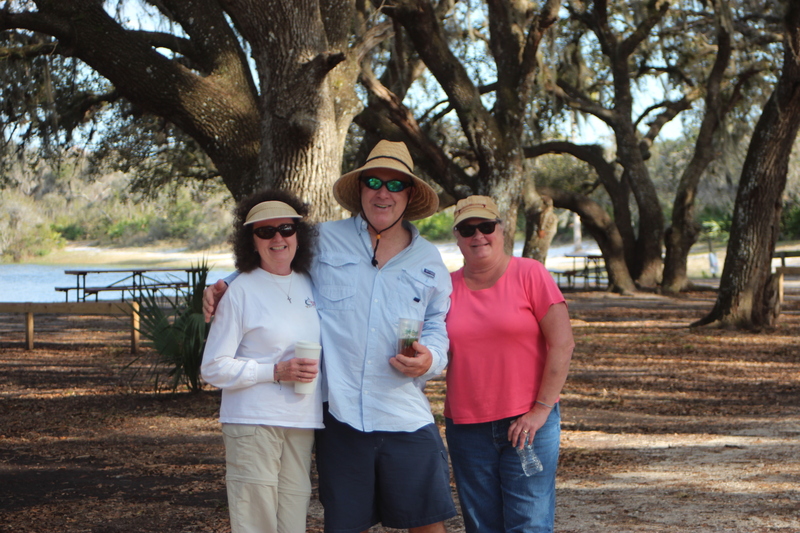 Good to see Ellen and her other daughter Ginger whom was enjoying a birthday. 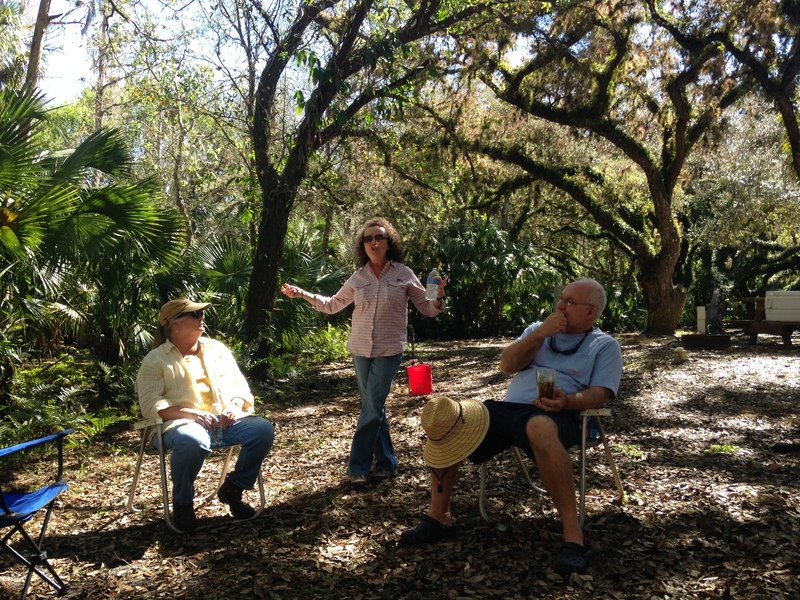 The goal for the past year was this ‘week at the Creek’ – with friends. 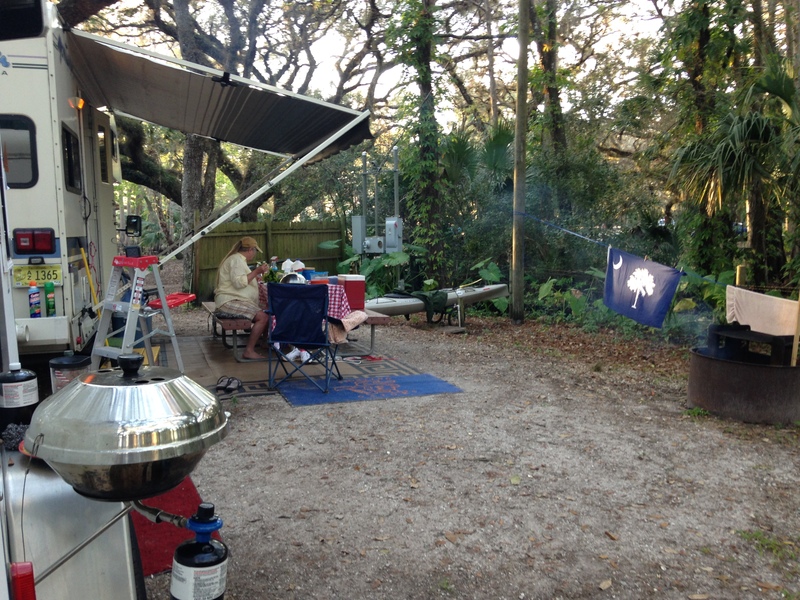 Al and Ava (FMHS 71) came in for a few days, and ‘pitched’ in – right beside us. 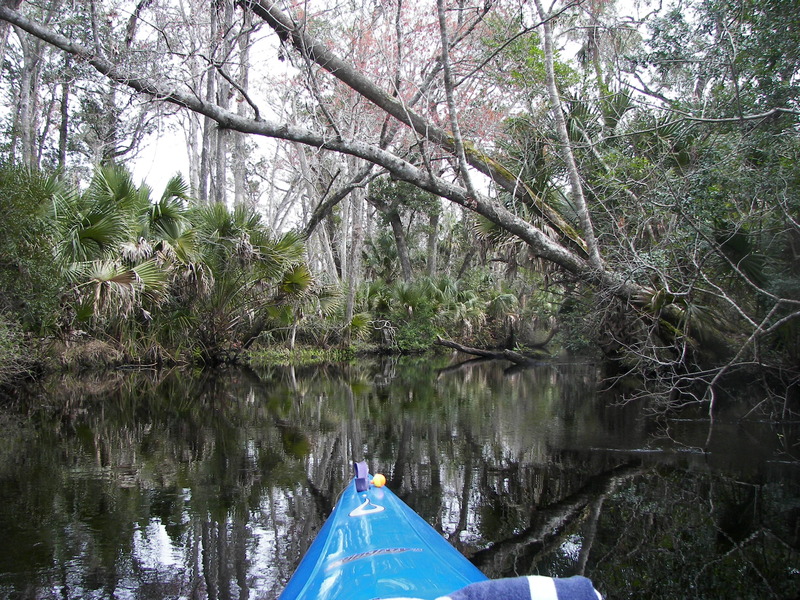 It was a time to enjoy what a place and folks have in common…..
and there was plenty of ez time within the weekday peace to take a paddle…. 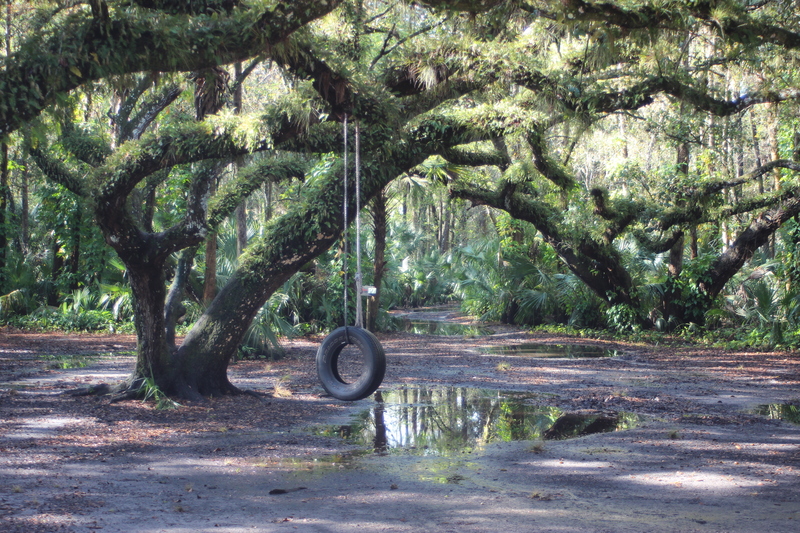 Life can be, a tire swing – if you let it. 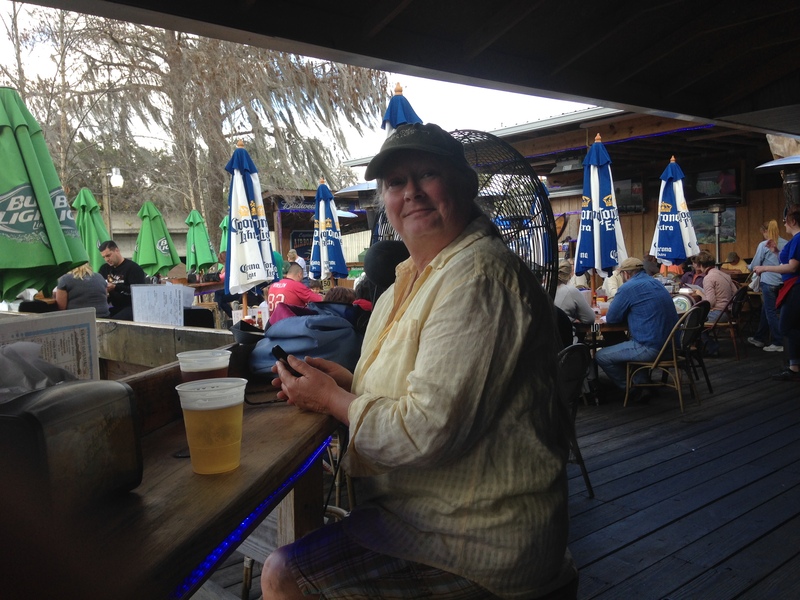 Kim and I remained through the weekend, as the crowds came – weekend at the creek changed, it was like a festival without the band. 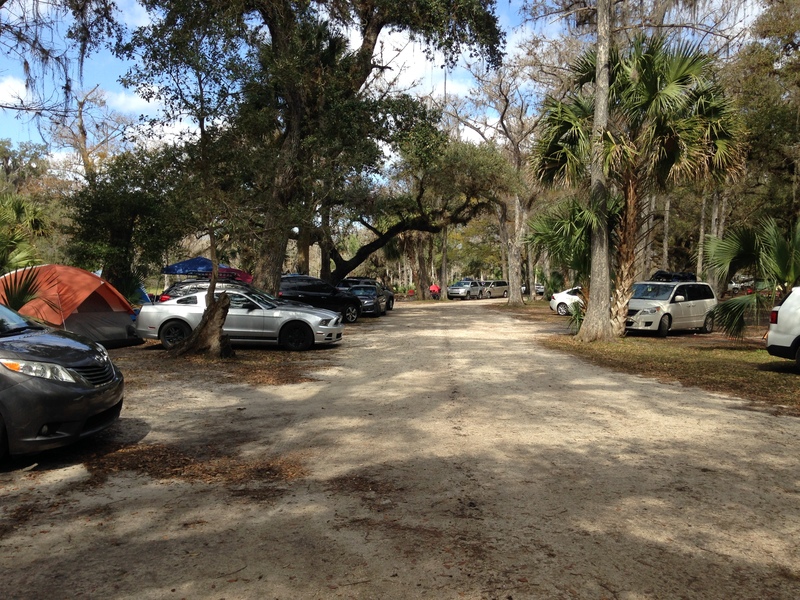 Full of people and their activities – all the canoes and kayaks were rented out, the campsites were full – even had a ‘Joe Dirt’ wedding taking place. I was impressed how the staff kept up with everything. We just rode the bikes around and watched it all in amusement, kinda like hanging around a boat ramp – cheap entertainment. 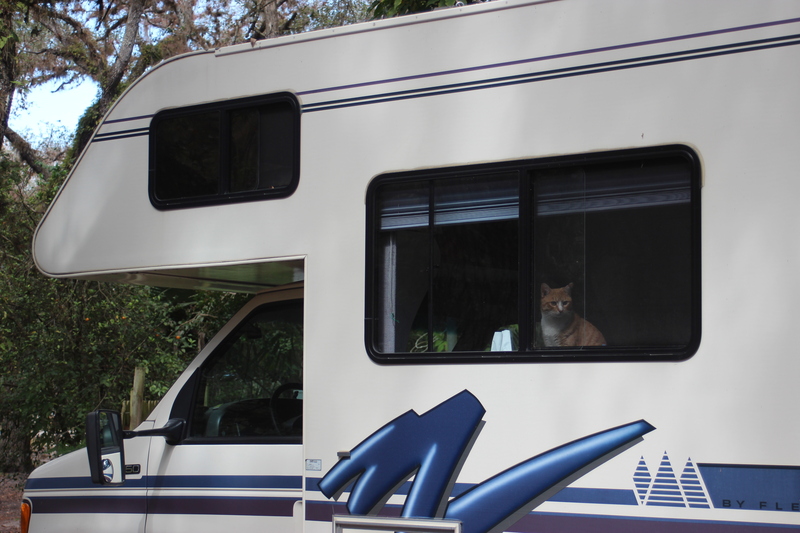 Sunday was the best though; we watched as the crowds departed…..
Otis’s first ride in the RUV was a positive; he operated at the same pace as everyone else and fit in just fine. Crazy how things can come at you sometimes – like a puzzle piled up on the table before us – pieces to consider; all part of another day. 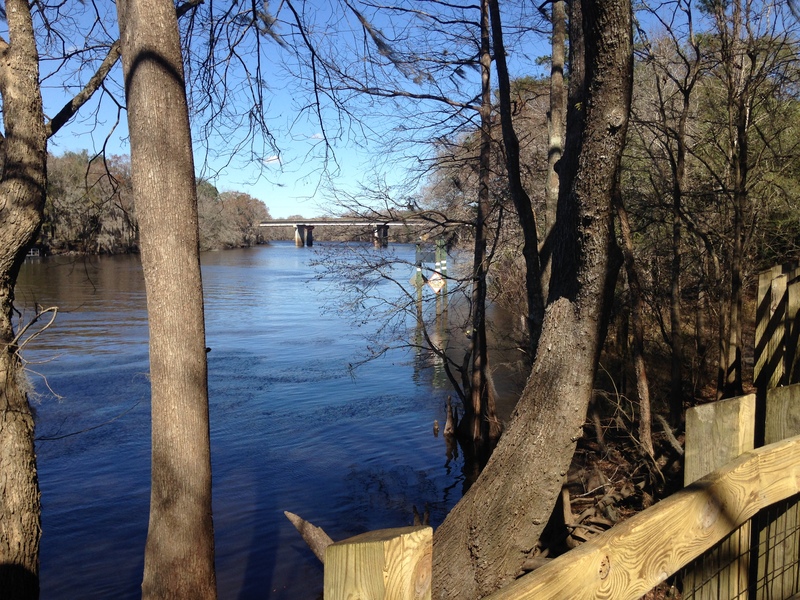 The easiest ‘pieces’ at the moment for me are in paddling and riding some of our older highways, the rest – well, I’m thinkin that things will fall in some sort of natural order with due-time. 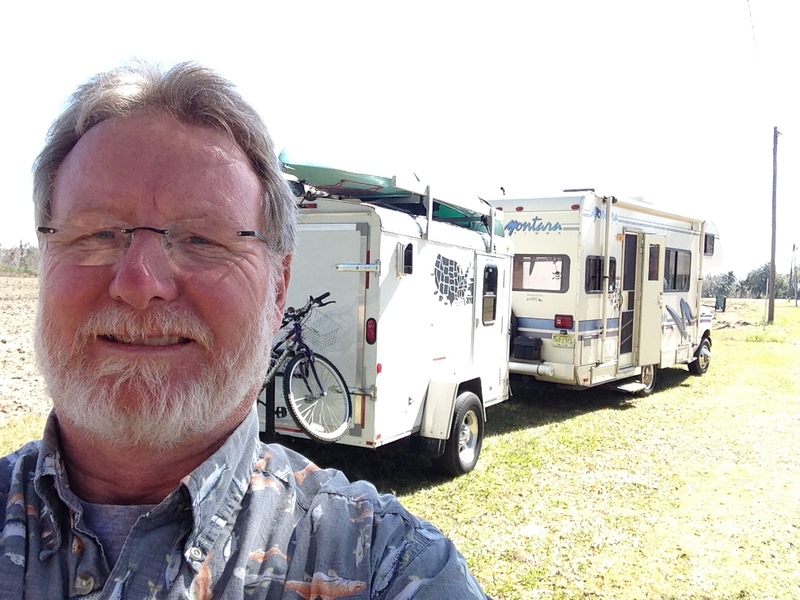 Simple objectives, no schedule (life at 60). Fewer responsibilities; seems to work so far. 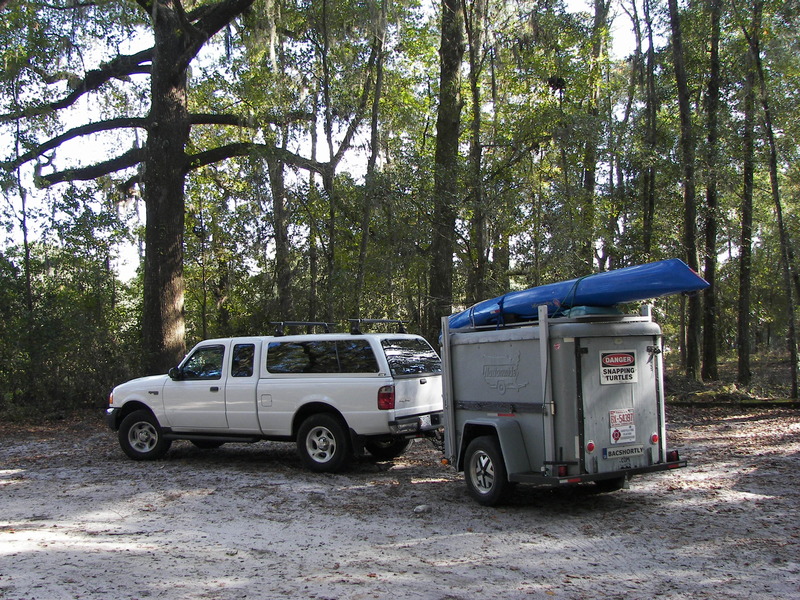 My plan for ‘a loop‘ down through Florida to visit my father; a cousin in Hobe Sound; a niece in Madeira Beach; and then to paddle in the Ocala National Forest with another cousin were all materializing – the little trailer was all hooked up and ready to go. Then I received ‘the call;’ Dad died.. In all true sense – as soon as I could lock the cabin door I was headed South. 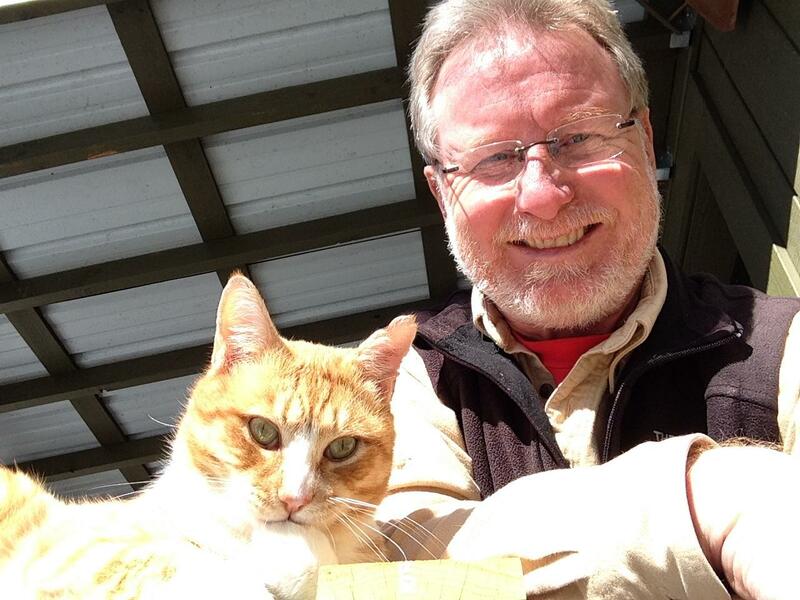 The previous post (WT Haynie 1926-2010) says the rest – ‘writing’ really hasn’t been on my mind; ‘riding’ has. 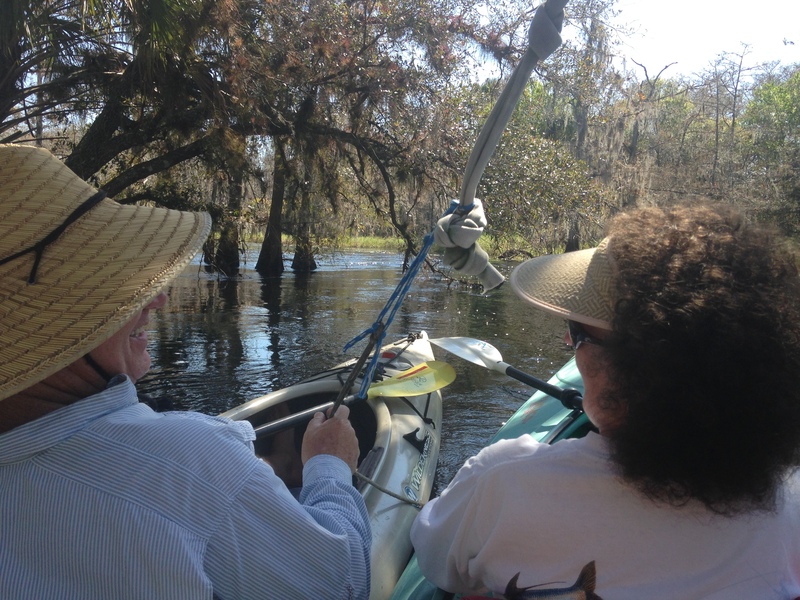 Dad could relate to a good ride; “ciphering”things out he might call it. 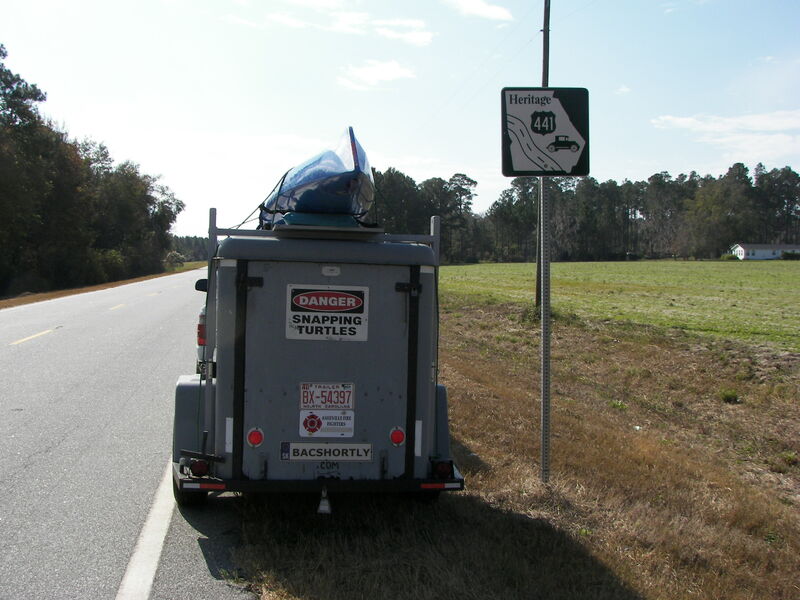 After the funeral, and with the little trailer and ‘traveller’ diligently behind, I idled up hwy 441 – to where our family had gathered in the 1960’s and early 70’s. 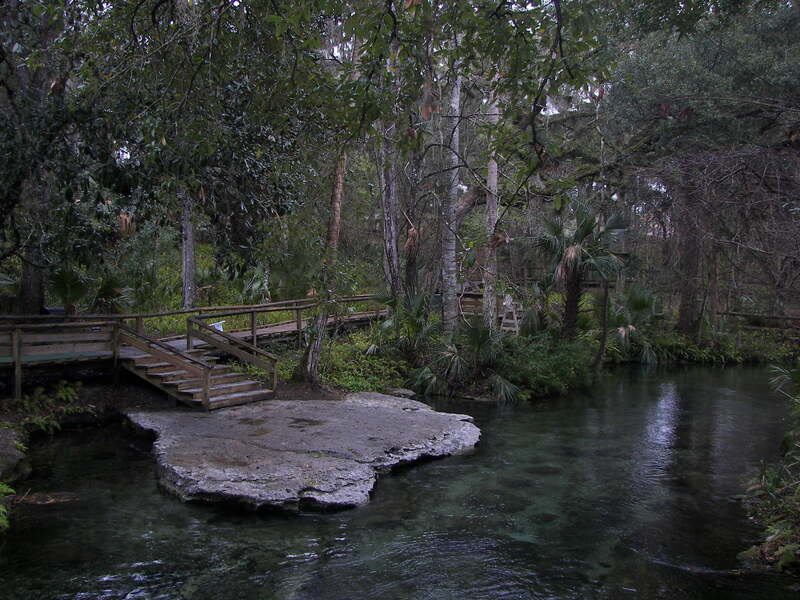 ‘Rock Springs’ as we knew it; Kelly Park in Apopka, Fla (that’s Dad above on the same rock as below). Hadn’t been there in 40 years and the place looked great! 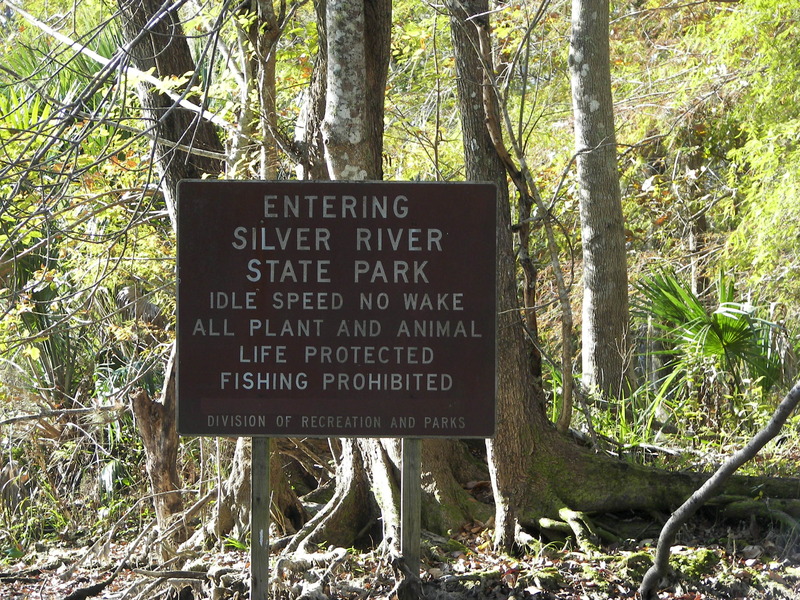 New boardwalks, nature trails, and many signs that emphasized wildlife management/ habitat. 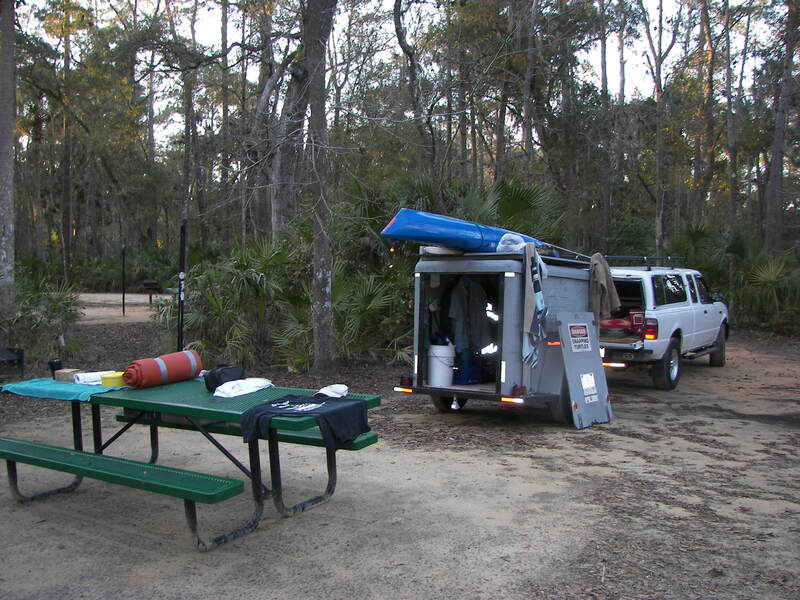 We used to get into the 67 degree water at the cave – then swim, float, or walk (exploring the ‘boils’ along the way) to the ‘second-landing’ near the main swimming area. 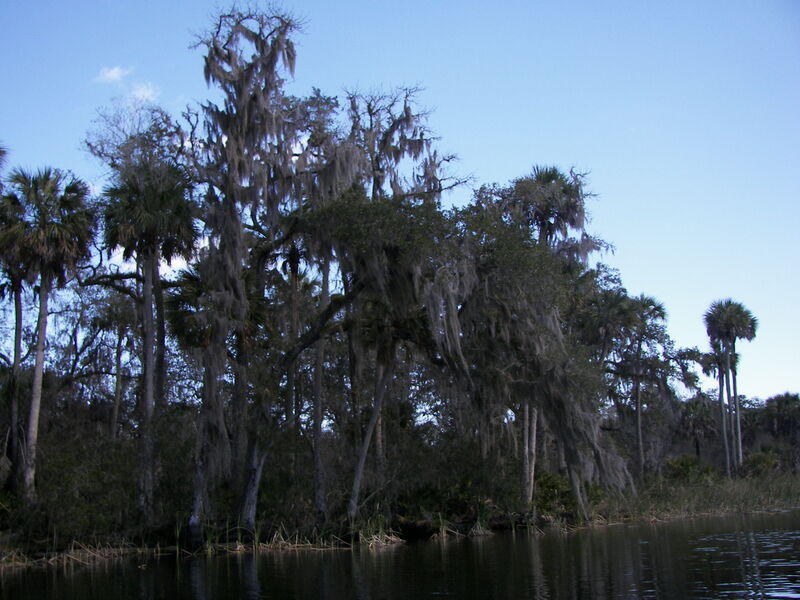 The brave ones would venture to the ‘third-landing’ (esp alone) which was something special because it further in the ‘woods’ (‘tales’ of ‘gators). the familiar atmosphere remained. I felt that some of the trees were the same, and now after so many years – I had returned. 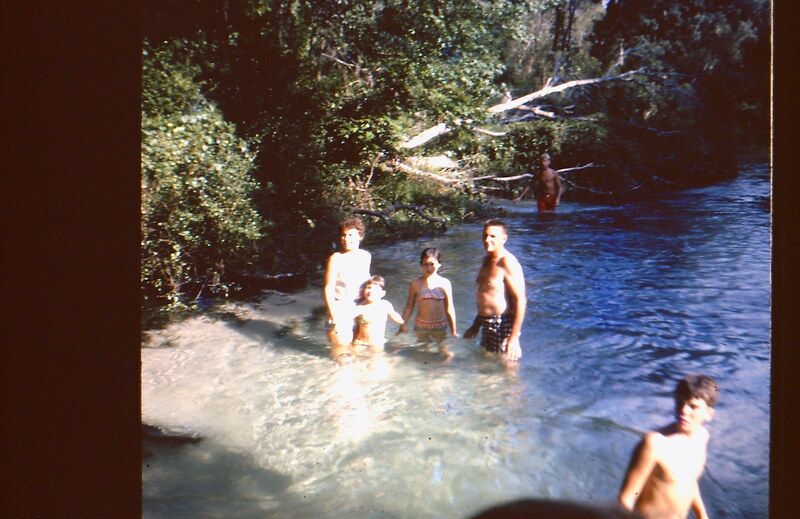 I was not disappointed with ‘Rock Springs,’ this was the place that our family was totally united in agreement over the water’s temperature – it was bone-chilling COLD! 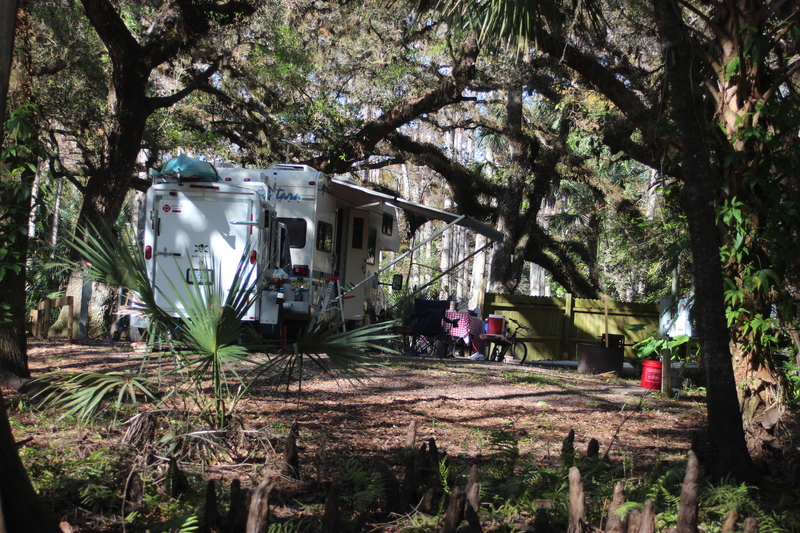 Over a ten-year period we spent many memorable holiday’s camping beneath the trees. 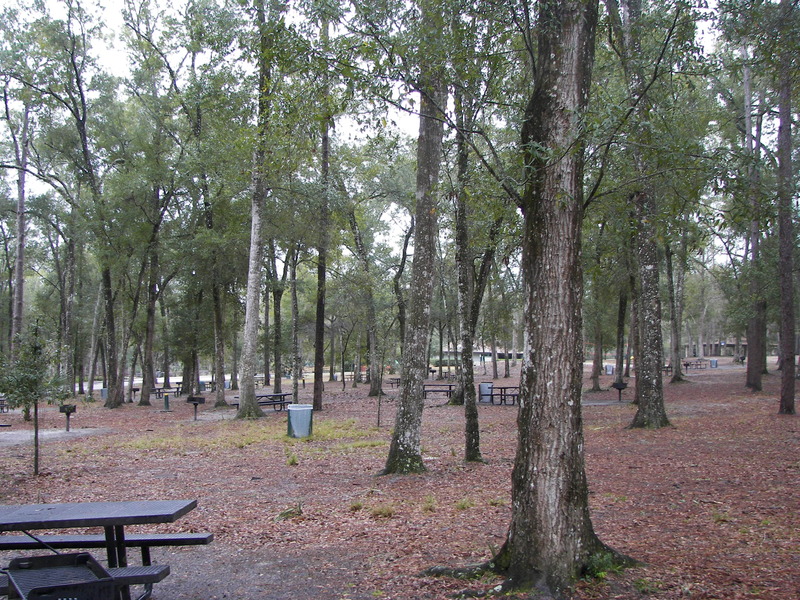 As a kid we learned to camp here. Potato salad, the kids drank ‘check-cola’ and the in-laws and parents quietly sipped cheap beverage. 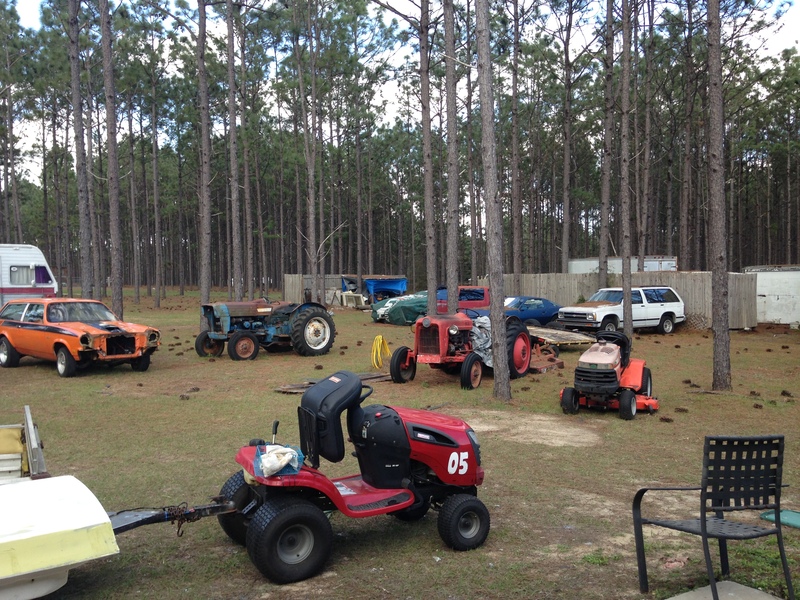 The radios of the day were tuned into the races at Daytona just a few miles away. I remember ‘Fireball-Roberts’ hitting the wall, he died. 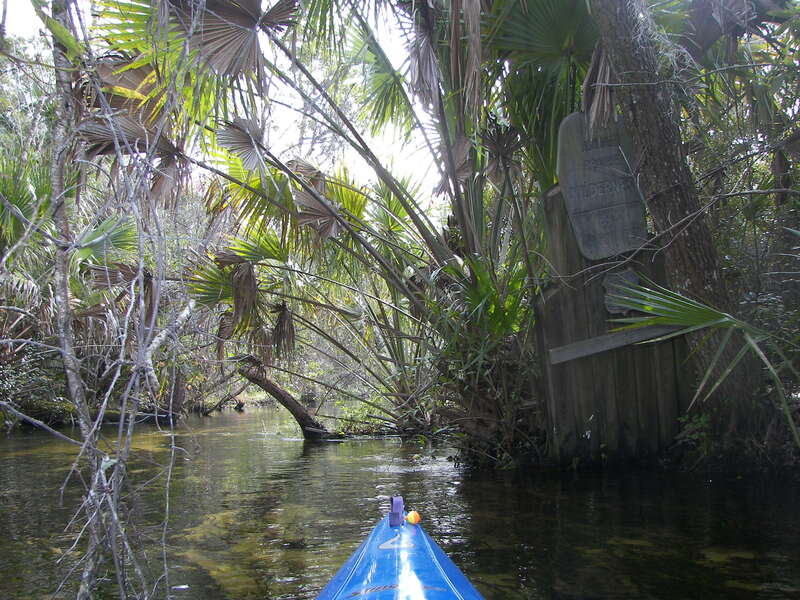 There is not a place to paddle through Rock Springs so I went a bit further along the same road past Camp Joy – to check out there; closed. 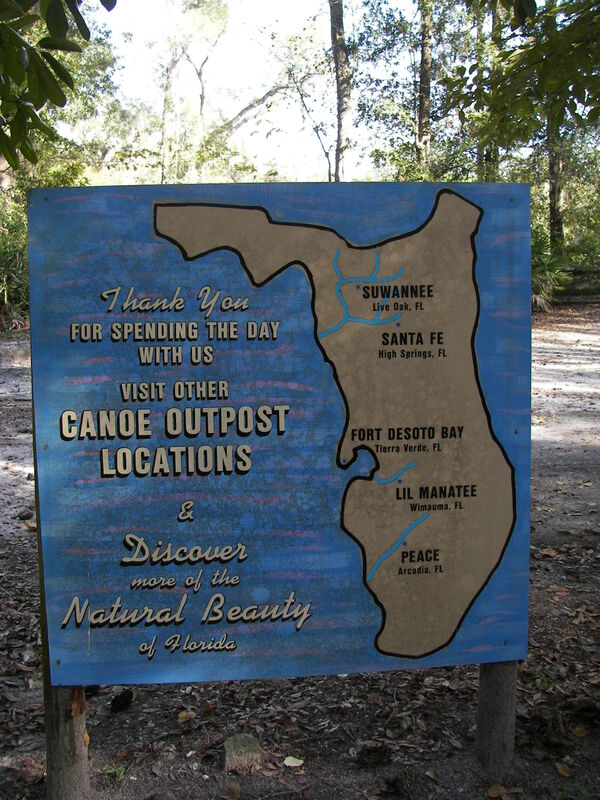 With some information my cousin Jo had given me (and a map from the forest service) I located the springs that I wanted to paddle – Salt Springs Marina for a ‘quickie,’ and Juniper Springs for a more extensive paddle and return shuttle. 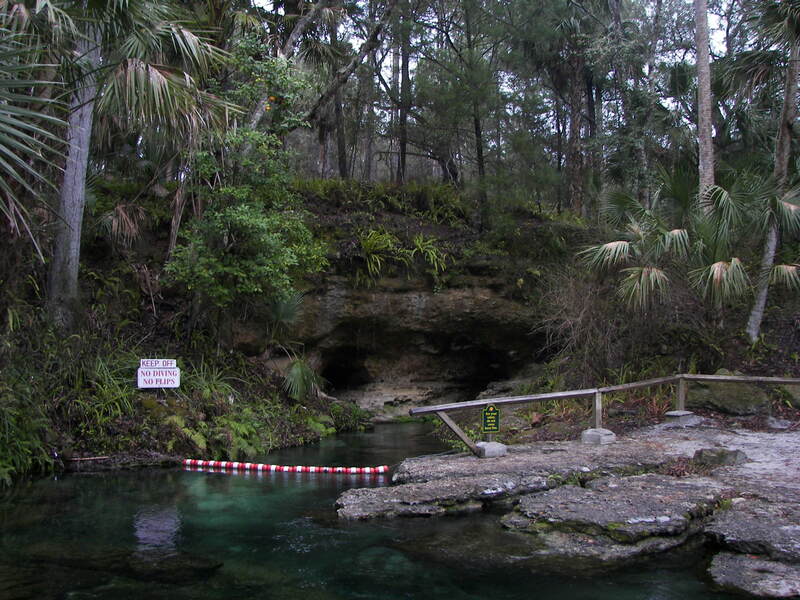 Salt Springs would help loosen up my arms, and Juniper would be the next day. 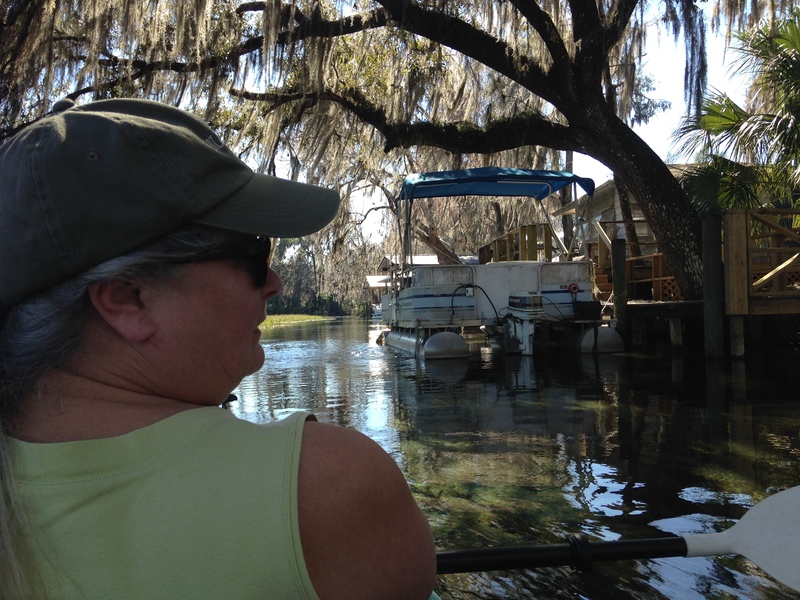 What I found from The Salt Springs Marina (nearby campground also) was a few hour paddle to Lake George, with a return trip against the wind – all was fine, especially as the Manatee and her calf playfully broke the waters surface beside me – neat. 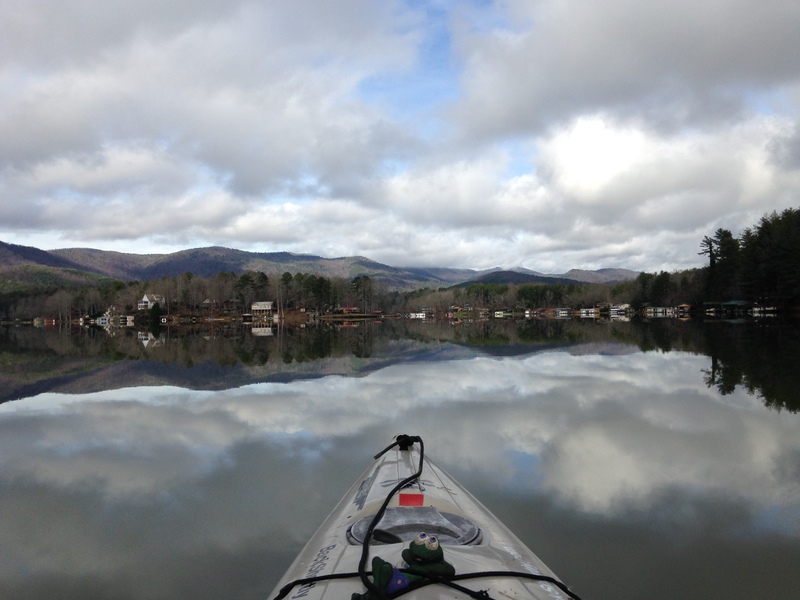 I did talk and drift with some other kayakers from Chattanooga too, so it was a good afternoon paddle – 2.5 hours down, and maybe the same coming back – 1230 pm until 430 or so. 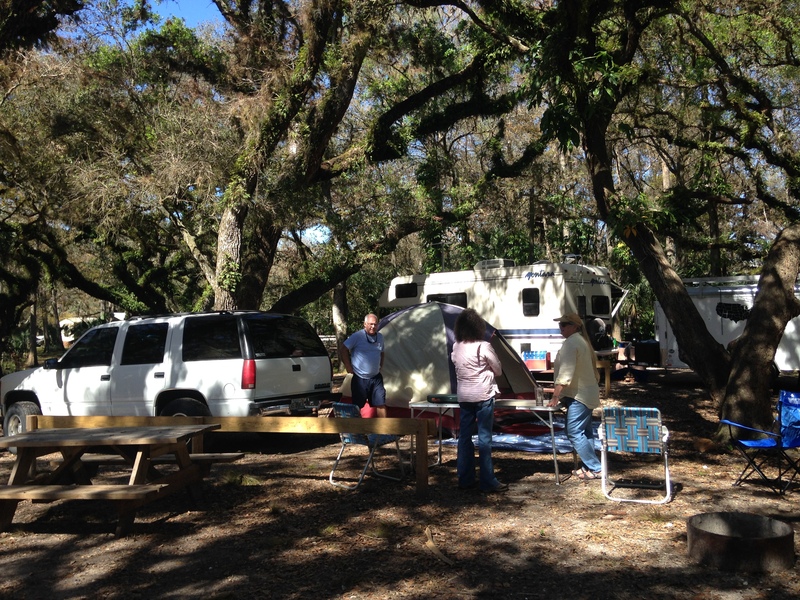 Camping is available at Juniper Springs with electric (near hwy 40 and hwy 19), and from checking with them earlier – it would be the best place for an early start (Ocala was 40 minutes away) so what the heck. A good shower is pretty important, that’s the biggest luxury I need – a hot shower. I don’t know what I would have to do if I had to choose between a pillow and a shower – lets don’t go there. But its nice to have a shower to start every day – I can make do with everything else. I went in as a camper; site 64. 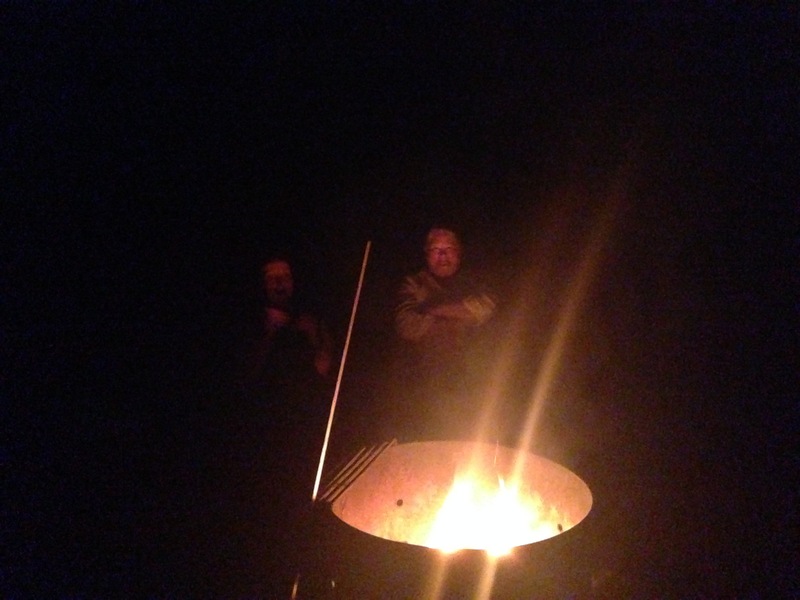 The neighbors partied most of the night and it was actually pretty nice to listen to someone else’s subtle jabber, camp-fire conversation and lite music in the night. 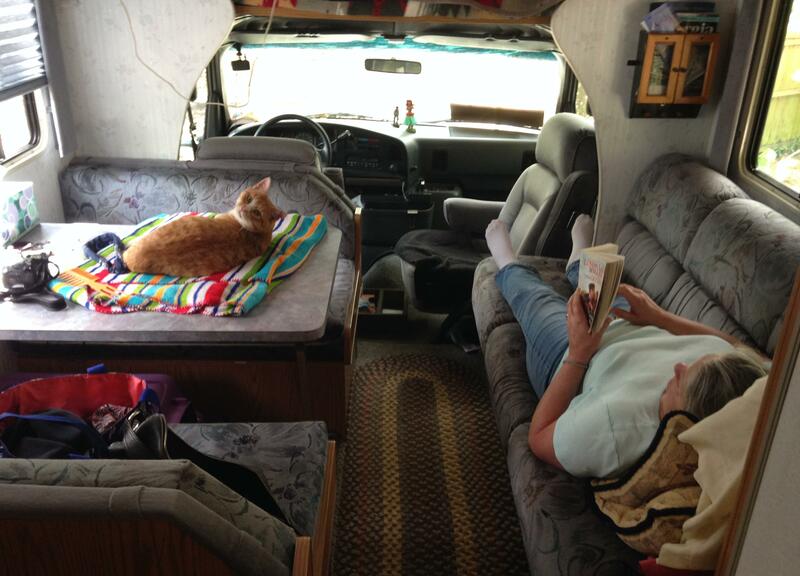 I laid on my mattress in the back of the truck and took it all in as “a free-ride.’ The rest I received from the night of camping was like I had slept with my ‘ears wide open,’ the distant traffic on Highway-40 might have had a little to do with it too. 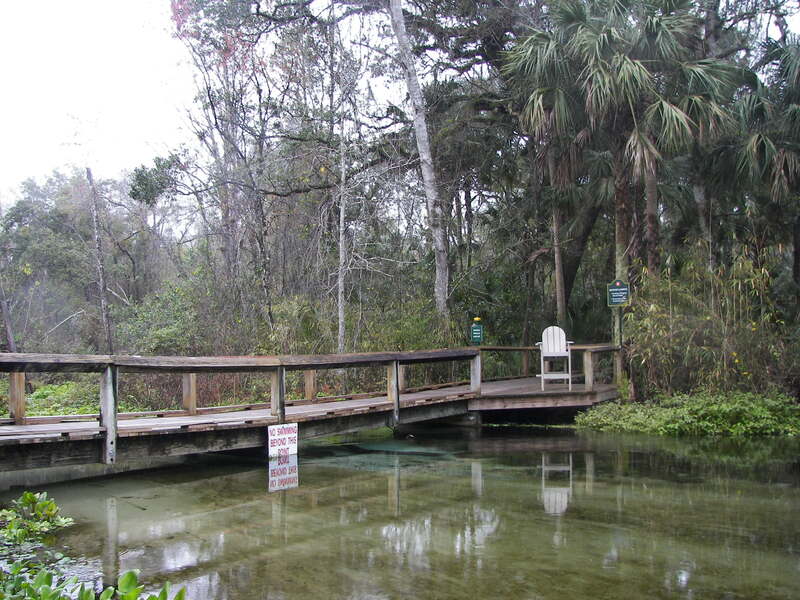 Anyway, Juniper Springs – 8am, put in at natural spring, flow with the basin as it combines and becomes a creek with surface flow. 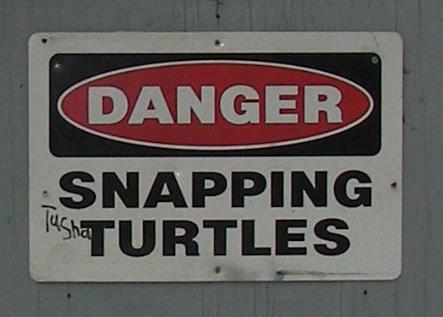 I had seen a sign that said “Not for beginners,’ I wondered how/why? 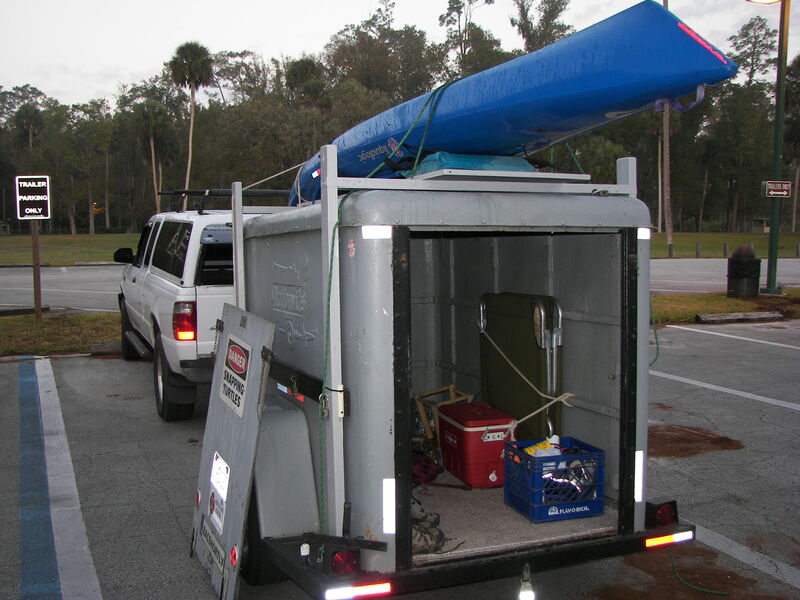 I had spoken earlier to some other kayakers about Juniper and they had inquired about my kayaks length (associating length with maneuverability), but my 14 foot Liquid-logic never confronted me once with handling problems (it was always human error). 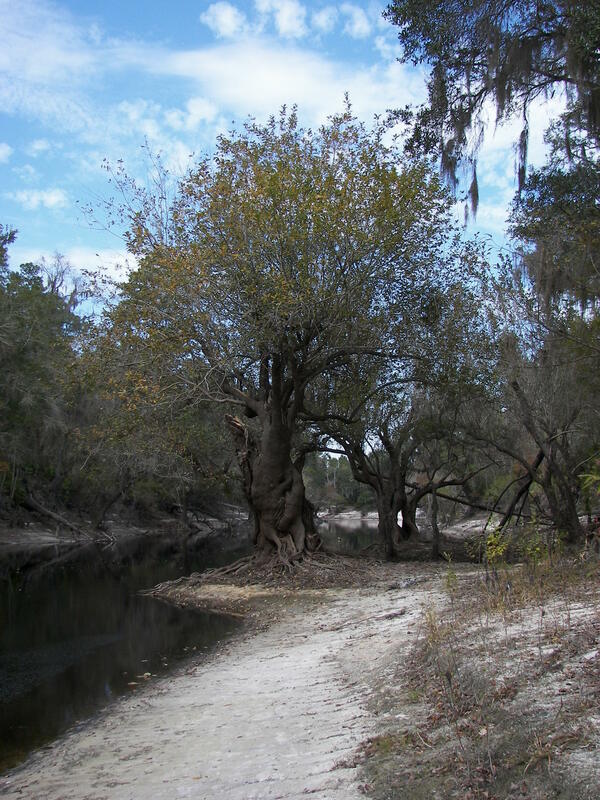 The spring is gentle and clear at first, and as the stream grows its a comfortable drift with the palmettos and wildlife that surrounds – a hawk hopped head level and watched me pass from 4 feet. Water drains from the land around making the clear water more of a ‘tea color,’ unfortunately there was occasional highway work going on in the background that I had to ‘tune-out’ and zero my attention back into the nature around me. In doing this alone, I thought several times that being solo added to the ‘peace’ of it all, it didn’t hurt my ability to remain clear of those ‘strainers’- certainly company has its benefits. 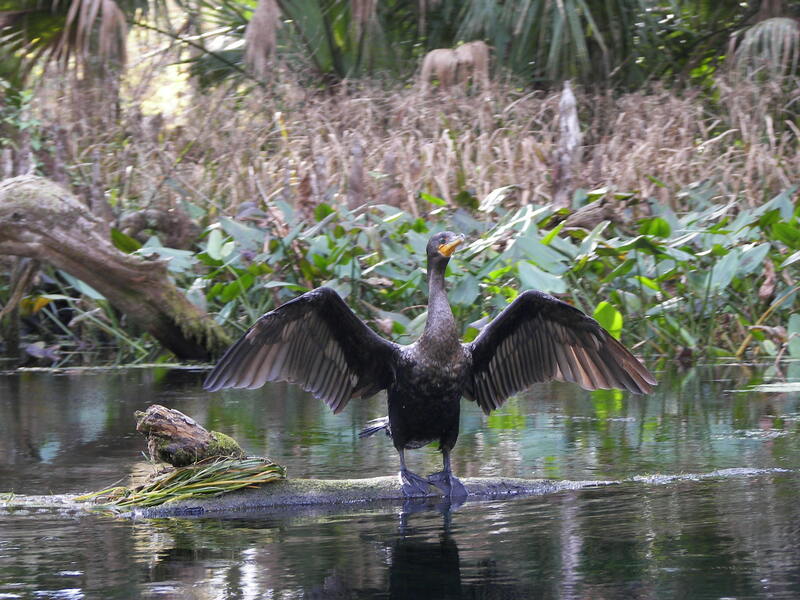 Stream into a creek, bending, ‘ducking, mostly thinking ahead while enjoying the serenity, it was present. The current could draw your craft to the side if you didn’t pay attention, I saw too many cypress tree’s with the ravages of canoe’s that had beaten against their skirt, ‘beaters’ I thought; as the scars are many which have healed through the years – also with that, I wasn’t perfect either. 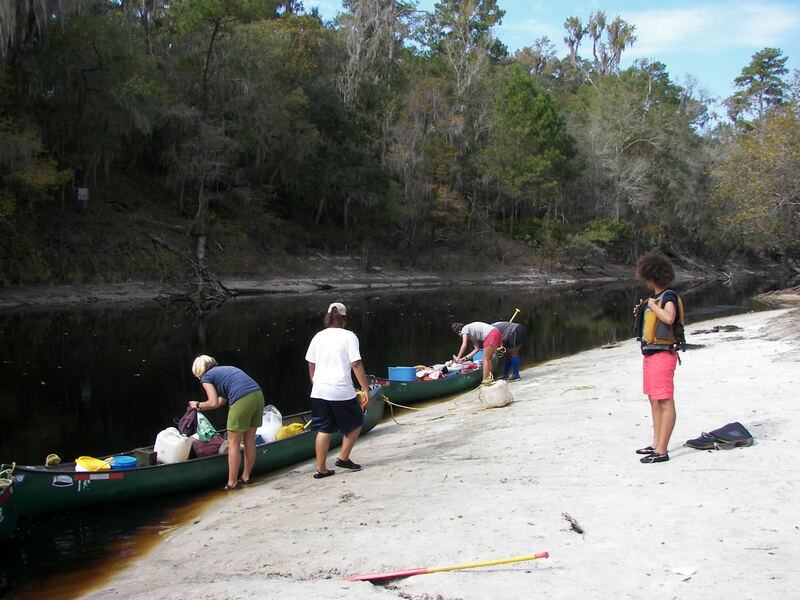 The route was adequately maintained and the many rental canoeist were likely a positive. 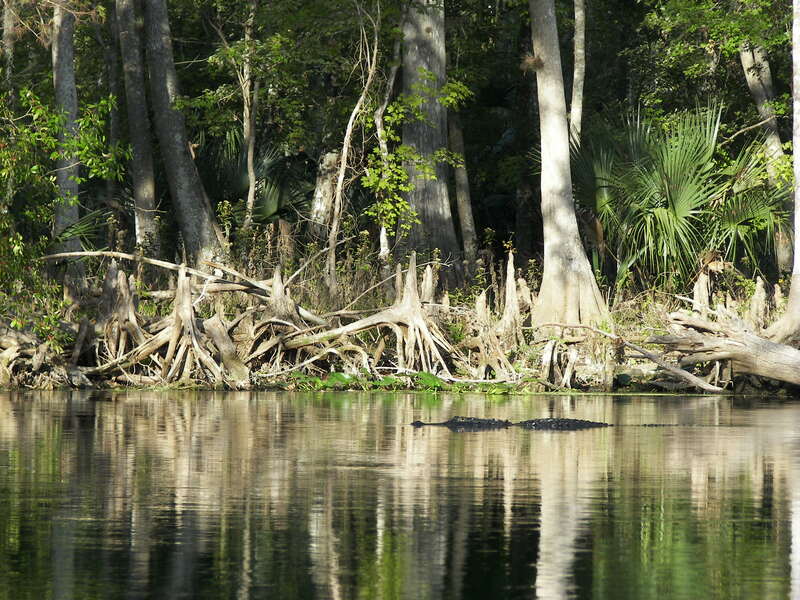 So as the kayaker on Salt Springs inquired of me, he asked – How do you know if an Alligator is near?, that’s easy I said – “you get chill bumps”..
They’re just big lizards with teeth. It wasn’t long after this field that the highway noise and bridge construction neared, the Park shuttle was there to pick me up right on time – well worth the few extra bucks to haul me and my vessel back to the park – a secured vehicle for the day, a ride back, and another shower. 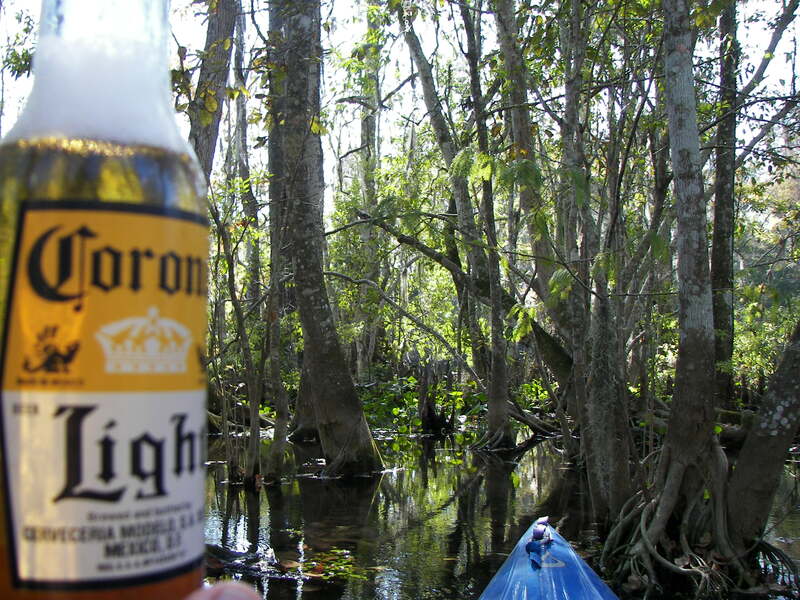 Wow, how could I have guessed that a day in the kayak could be simply enjoyable? 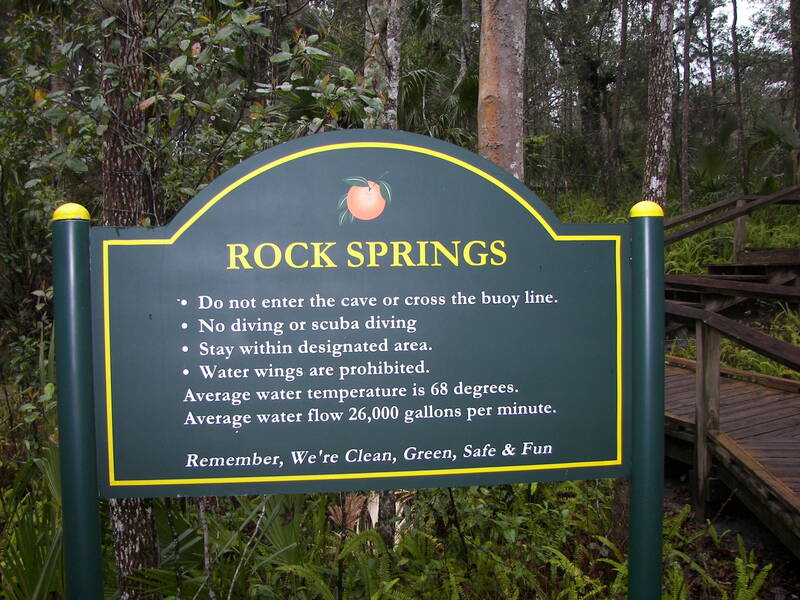 As a kid our family frequented a number of Florida springs several times a year (Rock Springs), I still get cold thinking about that water. 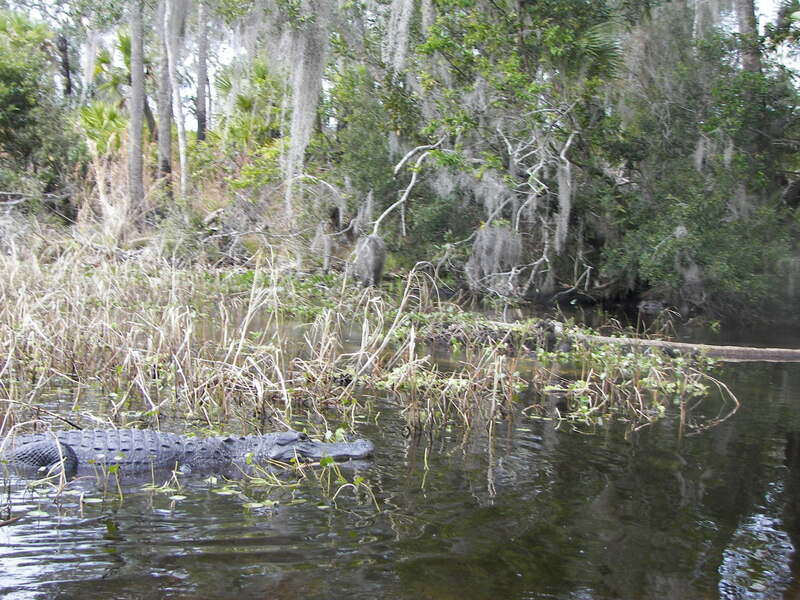 Back then I don’t recall if we shivered because of the temperature or with the anticipation an alligator strike (which never came), I suppose we just floated past them. 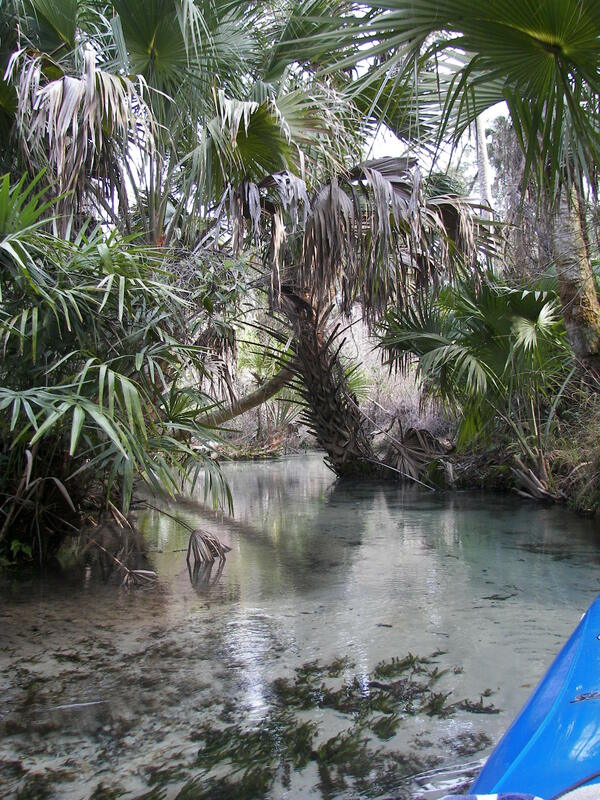 This is the first time that I have returned in a few years, specifically for riding the same spring water, this time in a kayak. 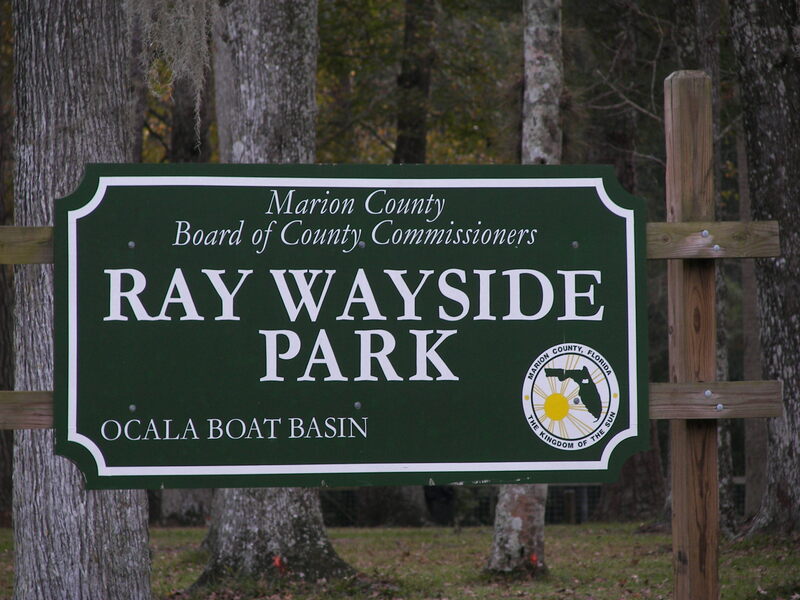 I headed to the boat ramp at Ray Wayside to meet-up with my cousin (a plan), Jo-Anne was one of those that swam along so many years ago. Its my nature to run ‘early’ for about everything, needless to say I was at the ramp at 630am waiting. With me traveling, our communication had been a little shady, so I really wasn’t sure if Jo would make it – but I hoped so. 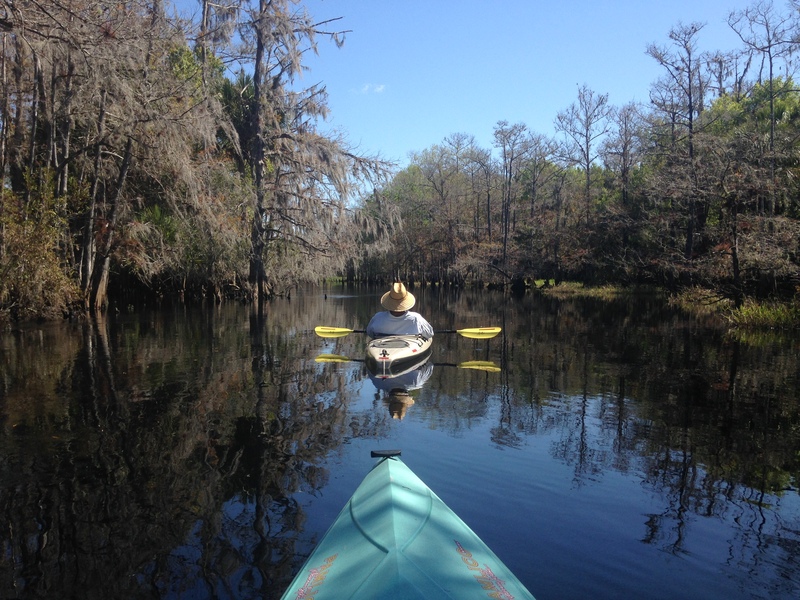 I waited until nine and knowing her spirit and gusto as a paddler, that she wouldn’t have any problem catching up with me – I shoved off (might have waited a little longer but some guy walked up and started talking, wouldn’t shut-up). Another part of my nature, I like ‘short-stories. 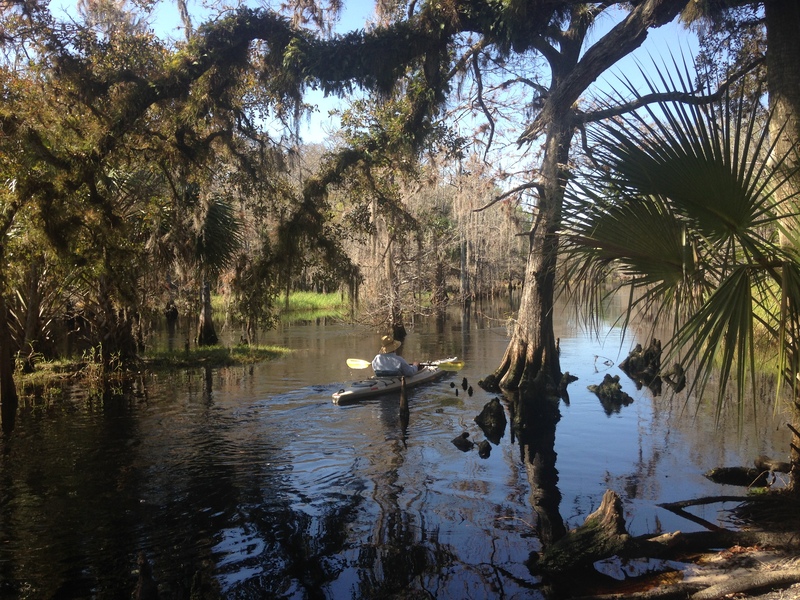 Wanting to enjoy the ‘peace’ of it all – I paddled on. So I left the ramp and paddled up the Silver against the current, really not bad just a matter of keeping to the inside of the curves and outside of the main current. 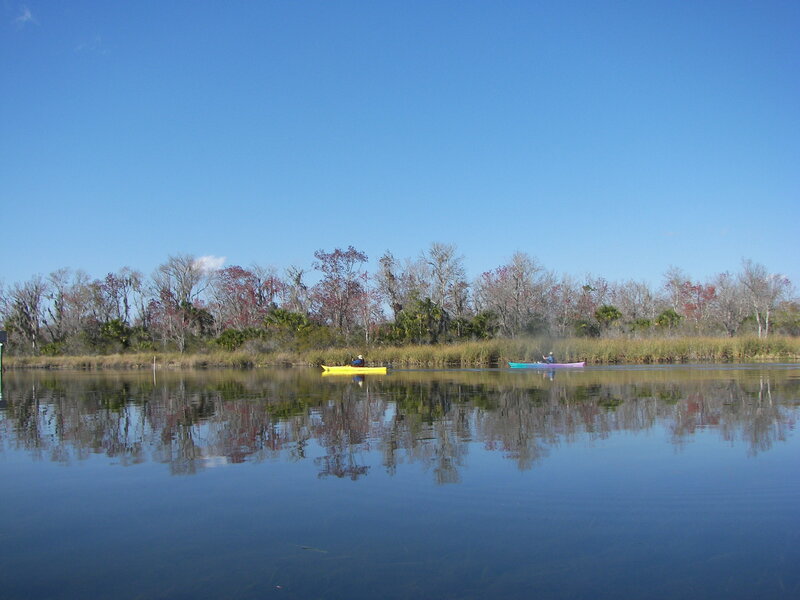 Seemed like I paddled for hours and I don’t mean that in a bad way – the time was thoroughly enjoyed within the natural peace that surrounded me – no fishing, no big boats, no noise….. 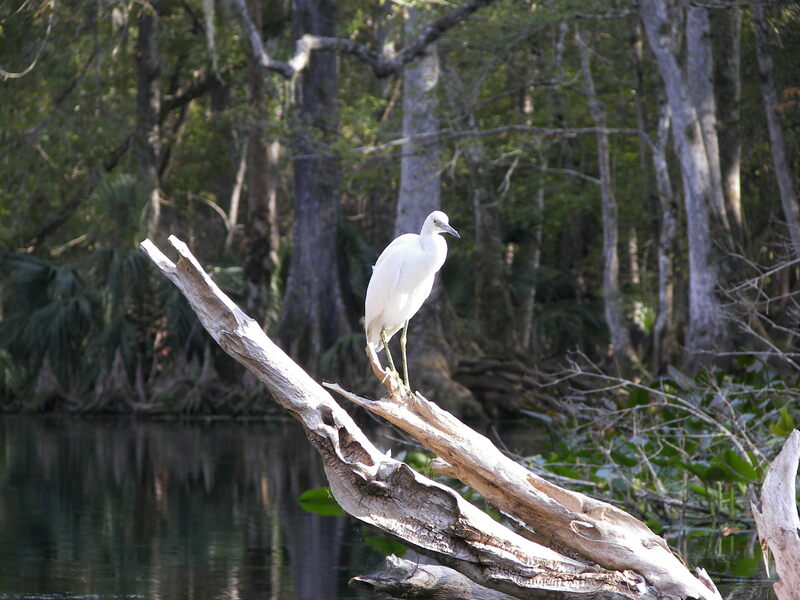 The turtles and birds did not always leap off of the stumps as I neared – I could usually get within two feet, and then on the return float it was even closer. 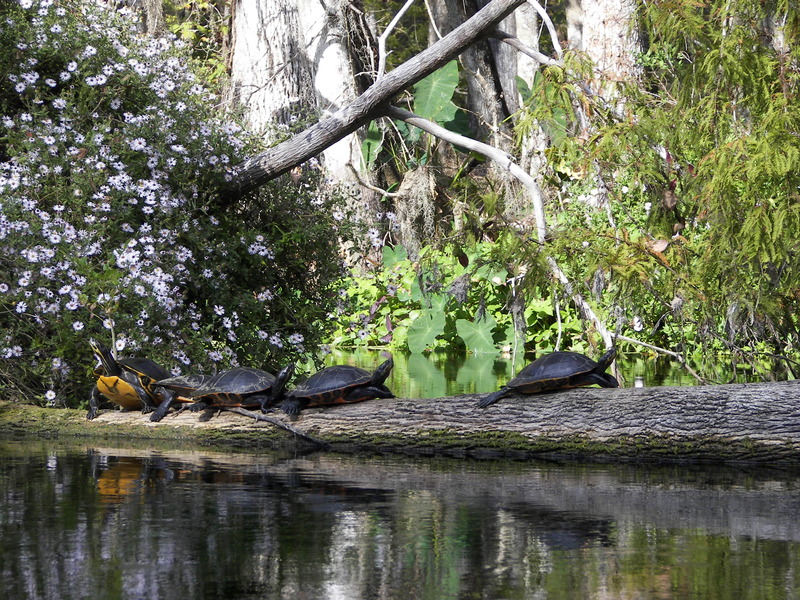 With the crystal clear water the turtles that were in the water simply appeared to be suspended between me and the river-bed – large dark fish idled along the bottom too and ‘lazed ‘ in the clear sandy areas. 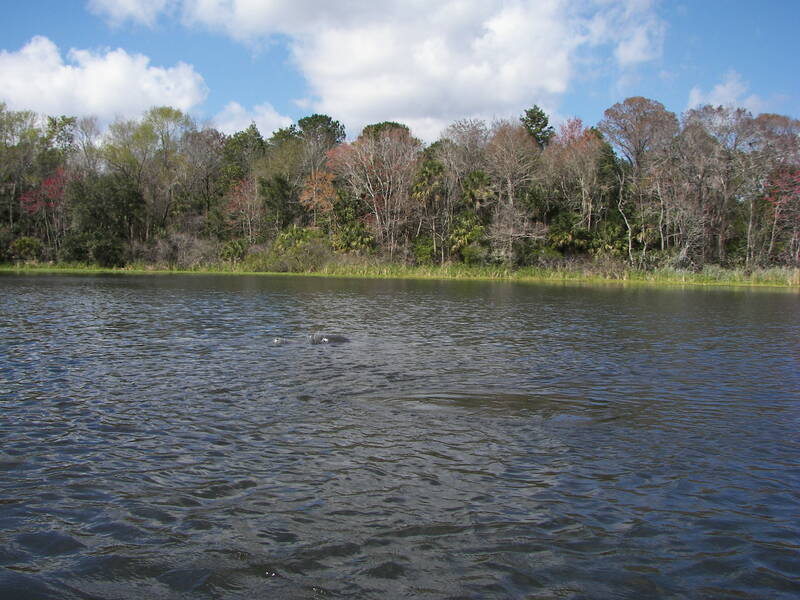 There were gar passing in between also – much like Ichetucknee Springs. 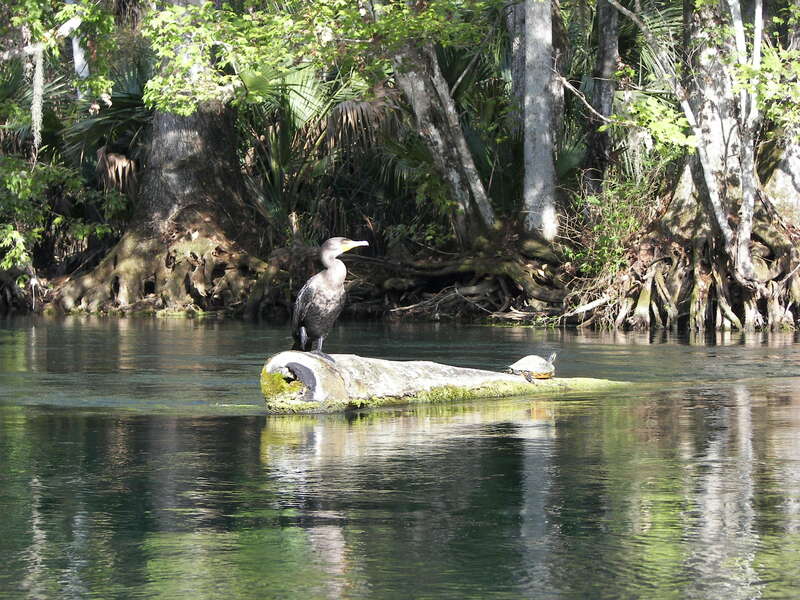 The cormorants (yes I know the other name for them) would dive and swim after a fish, all easily witnessed from the kayak above. It was possible to see thirty feet down, the nooks and crevices added to the character of the bottom while the current moved the occasional seaweed like a slowly waving flag on a warm summer day.. 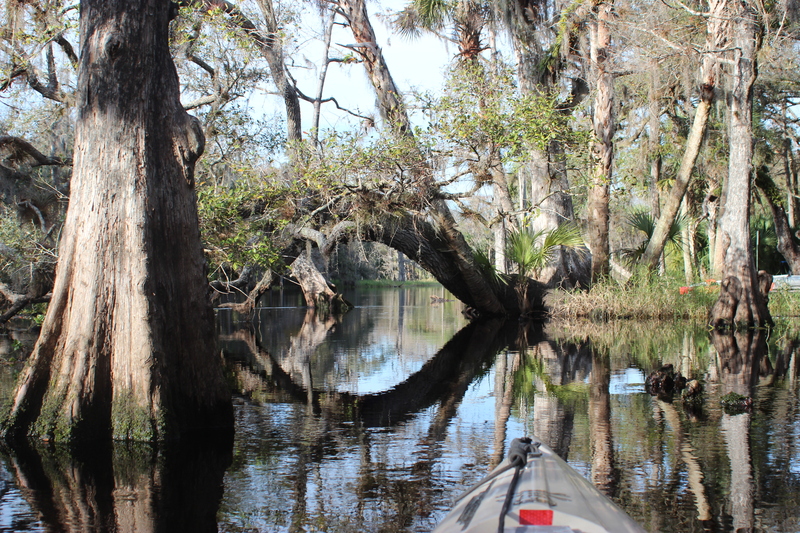 The natural peace of it all was everywhere – the shorelines were filled with cypress trees and their knotty protrusions, palmetto bushes, tall oak trees, and dead lifeless ones too. 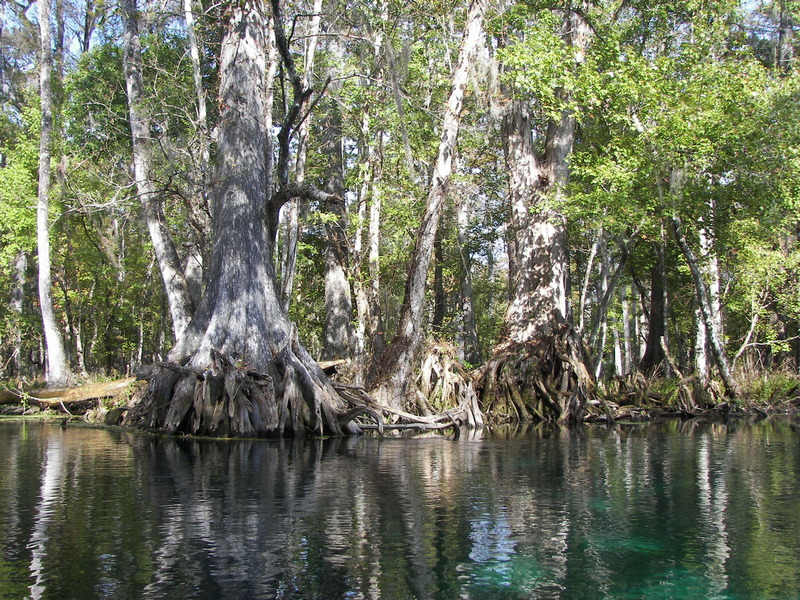 I passed complete trees suspended under the water, it all had that three dimensional feel to it (like Tahoe) – a different view in volume that’s for sure. 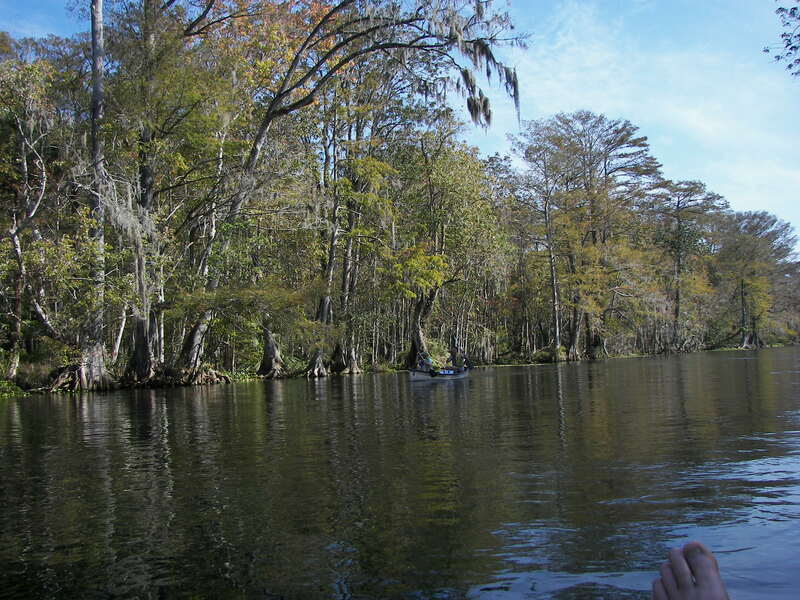 The time paddling upriver was much less noticed that the surroundings and before I knew it I was hearing voices. 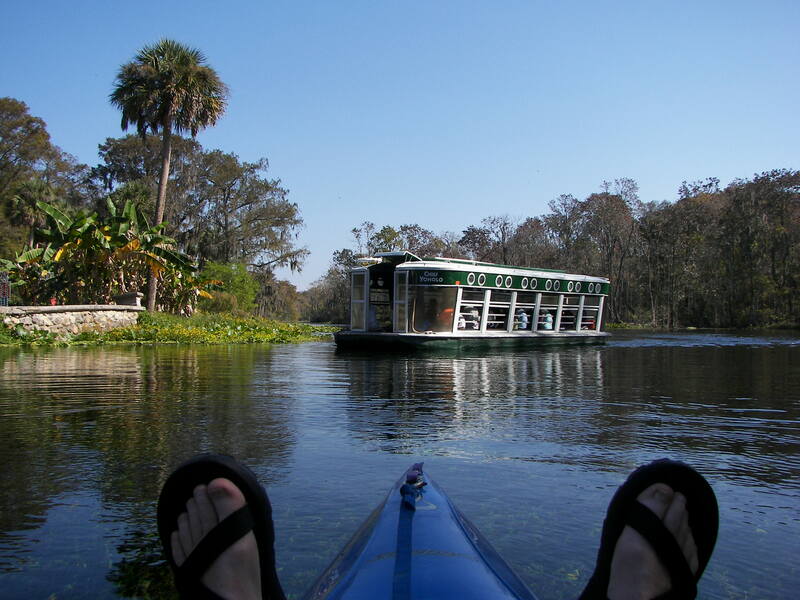 The Captains of the glass-bottom boats were describing the scenery to the tourists, so I floated along and listened…. 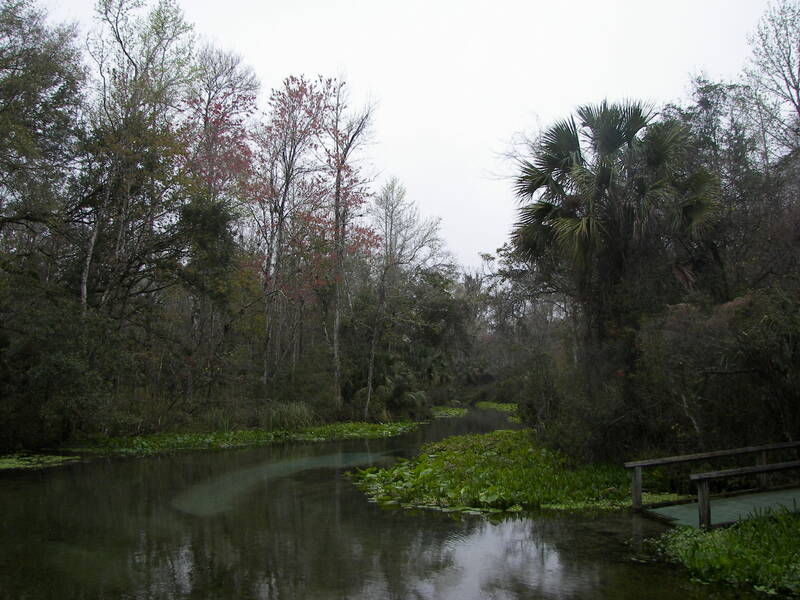 At the mouth of the springs was the tourist attraction corral (Silver Springs). 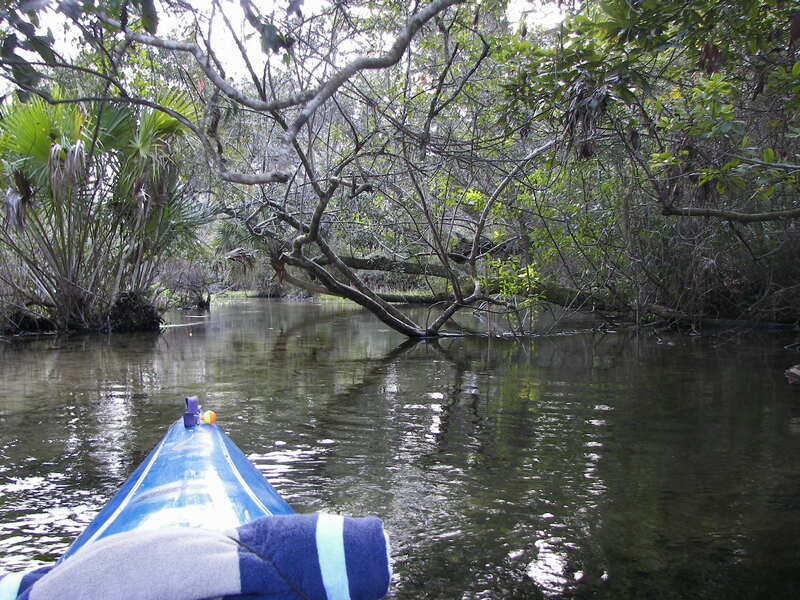 When arriving as a paddler (as I did) it is necessary to stay in the water – in your vessel. 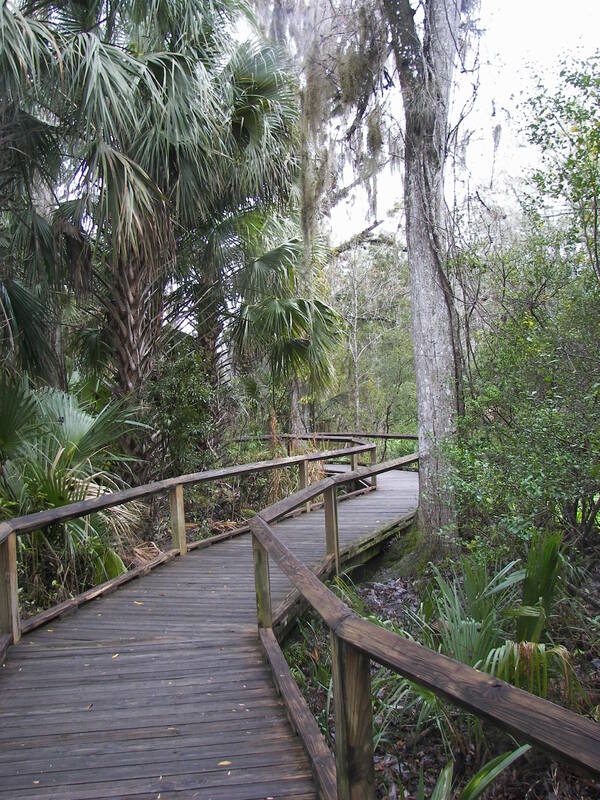 To do otherwise within the park you could be charged with trespass – but I understood this and simply put my ‘feet-up,’ opened my Subway, and began to ‘go with the flow’…… soaking it all in. 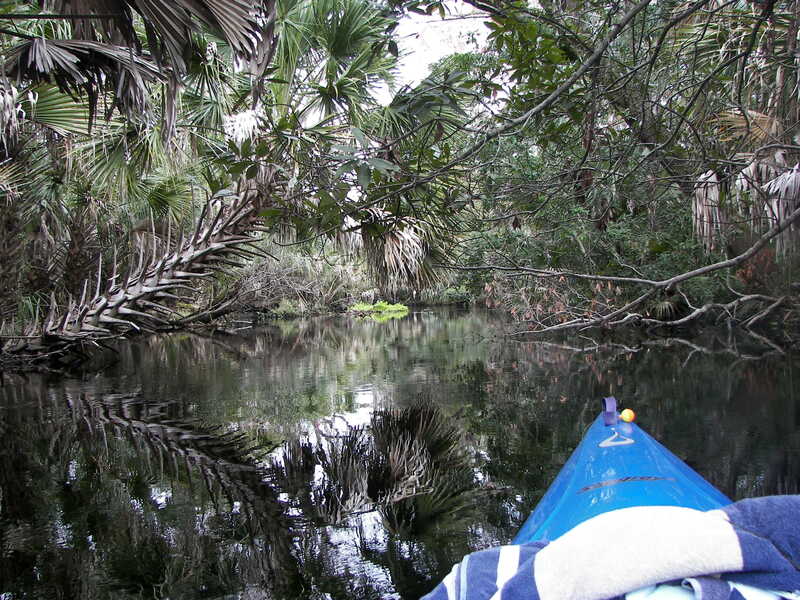 For the next three hours I peacefully coasted, only seeing two other paddlers and a troupe of ‘bantering’ monkeys along the way. 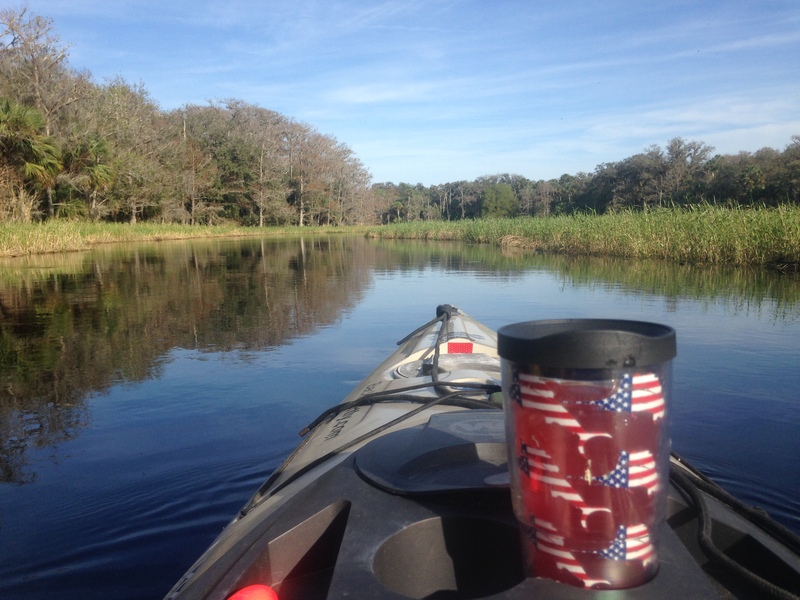 Again, it was all really nice and I was comfortable, floating along with my feet in the water…… With the bright sun and clear water, the shadow of my kayak (and feet hanging out) moving along the creeks sandy bottom was like soaring in an airplane. 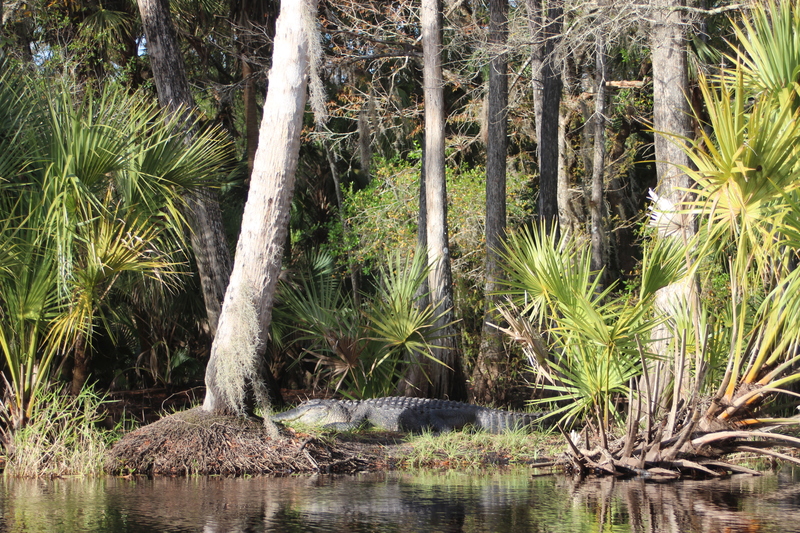 As I basked within the wonder of it all, I recalled the PBS show about killer sharks coming up on their prey – and then I thought about the alligators. 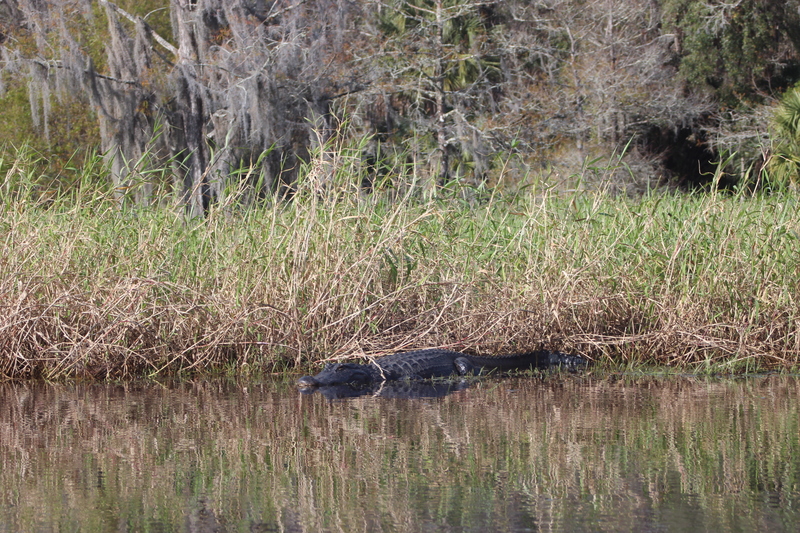 Now the Native Florida Black Alligator is not an aggressive beast, we can live in harmony and do – I saw three on this date – still, I did put my feet back in the kayak. 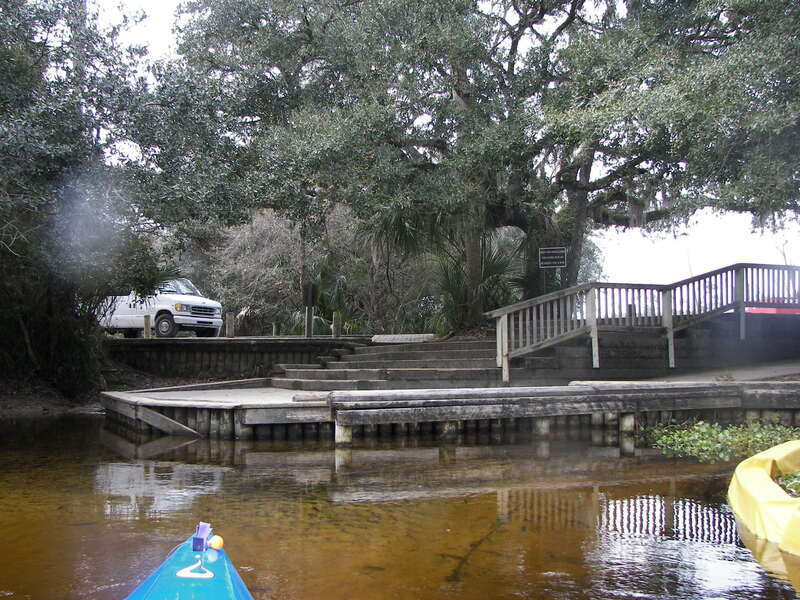 Reluctantly I made the turn back to the boat ramp around 4 pm, it was a really incredible float…. 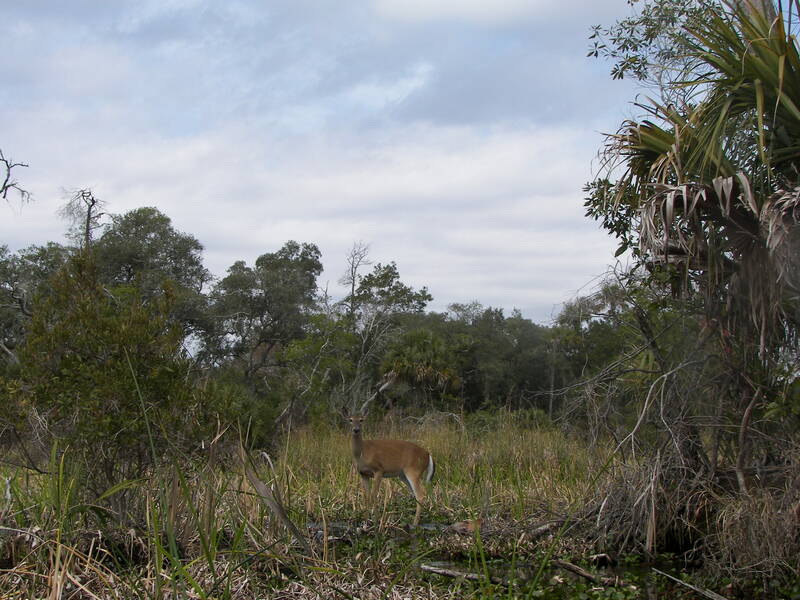 Fall/winter/weekday are positives, insects are minimal – larger animals moving slow….. traffic low. 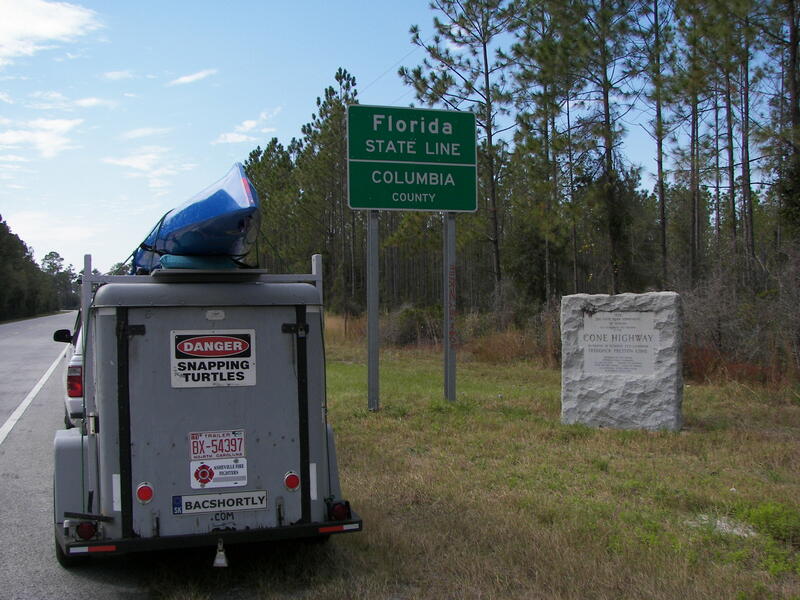 It was a nice ride down through Georgia on Highway 441 from Athens into Florida (the old highway) all the way to Ocala, without the ‘luxury’ of an interstate…… sure, there were some stop-lights here and there – but other than a very few inconveniences the ride was pleasant. The towns were quiet, school-buses were fewer than expected, antique stores were common, and there was an overall desolate feeling to the ride – I bet I didn’t cross 12 other vehicles in 6 hours. To enhance all of this the November day was very distinctly outlined in comfortable clarity. Its difficult to realize that I am out of the “gotta get there” mentality, but I have continued to find a way to make it fit. After so many years “travel” meant that we gotta GET THERE! almost a bee-line mentality. To finally feel the comfort of the highway passing along with the ability to stop and capture any moment of the wayside air has been a long time coming – it was tough not to lean back and put my foot up against the door frame like a recliner. 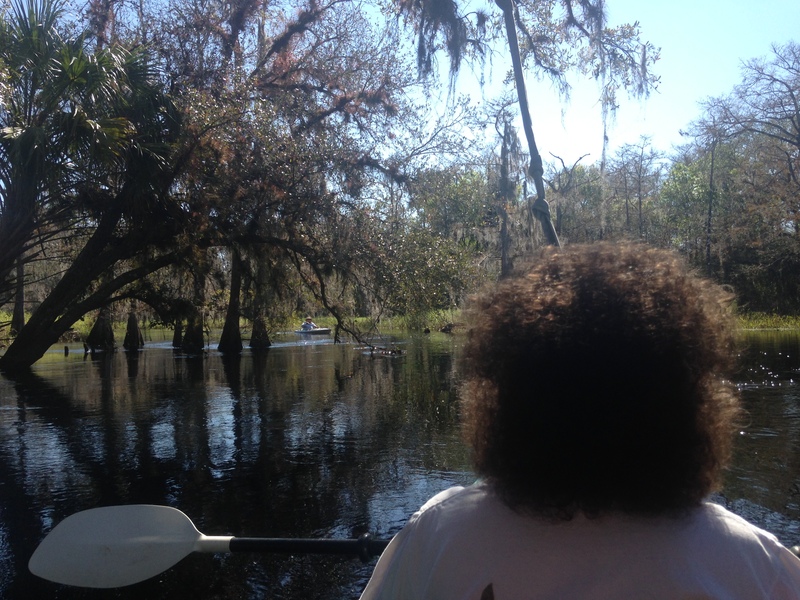 Just before crossing into Florida I had noticed the Suwannee River at Fargo and it looked ‘paddleable’…. 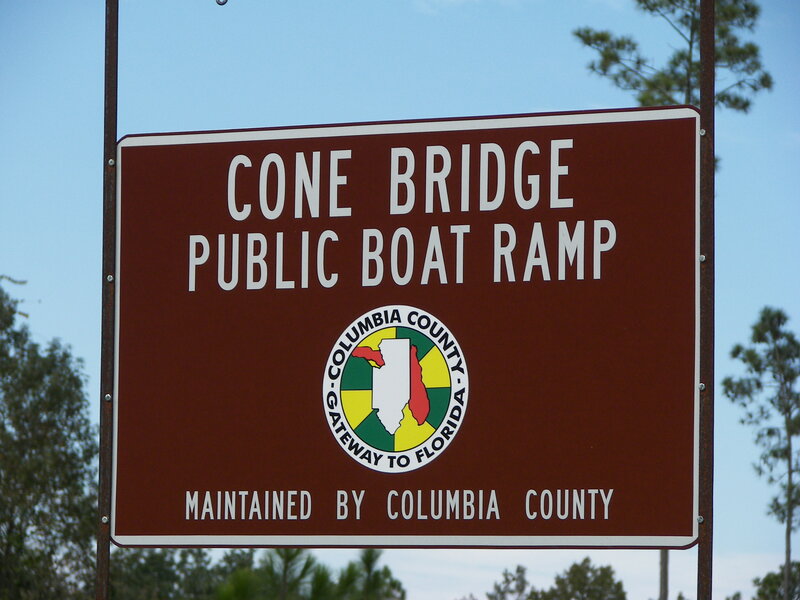 to tell you the truth I didn’t realize that it was a product of the Okefenokee Swamp in Georgia and not a Florida derivative… any way at the first opportunity of a boat ramp to it, I took (for more reasons than one). 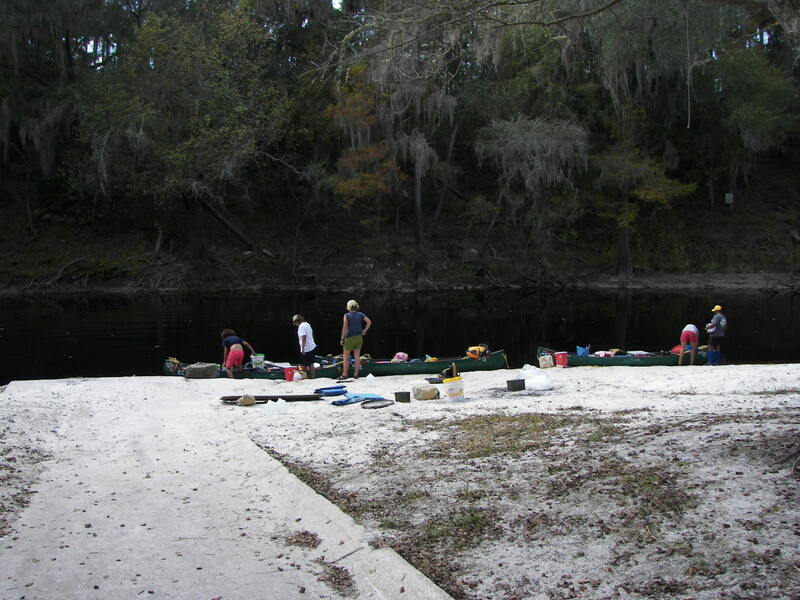 This troupe of girls were at the ramp and had been on the river (180 miles of it to the Gulf) and were stretching their legs as I took my walk – interesting, and yes – it certainly has me thinking that I would like to float the Suwannee river too, no – not for the girls….. but what an awesome setting. 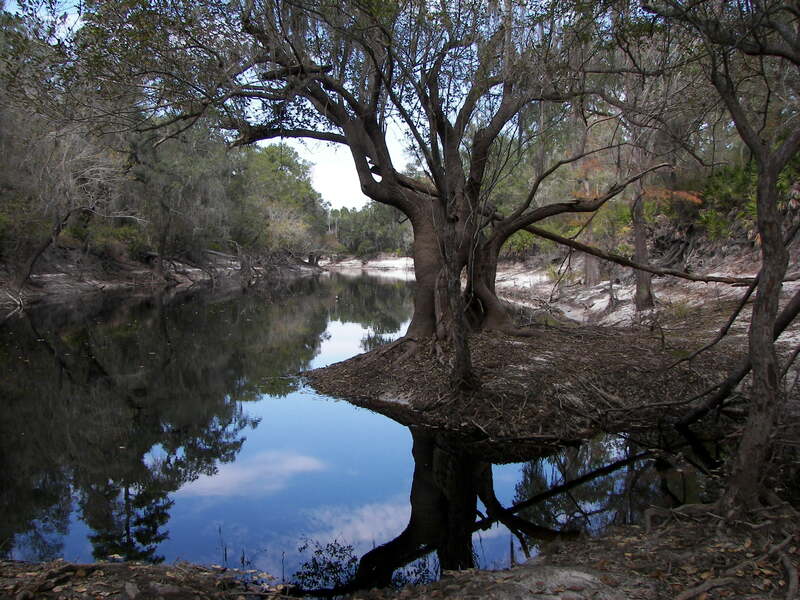 I could only imagine that at one time Stephen Foster might have rode this creek and was inspired, “Way down upon the Suwannee River...” (later I learn that he had never seen this river, the words simply fit into his song, good fit). 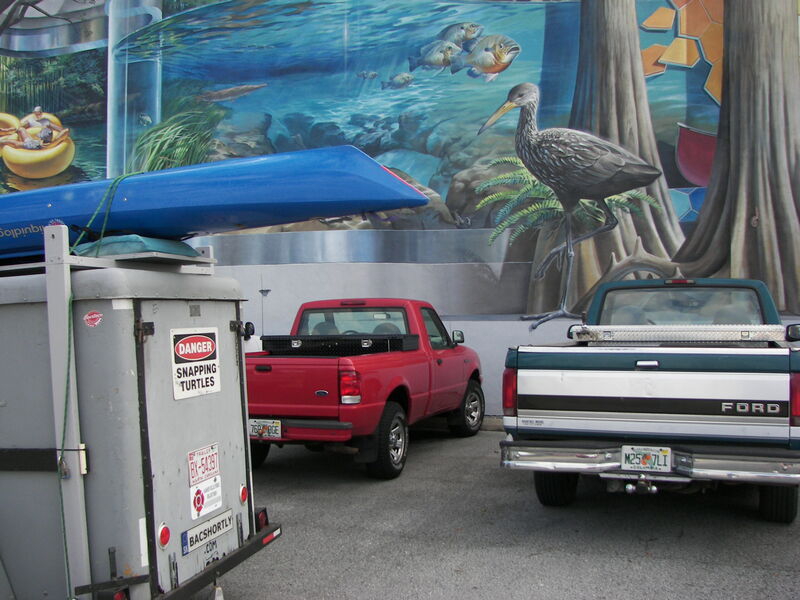 coming into Lake City there were was a giant wildlife mural, birds and stuff…. 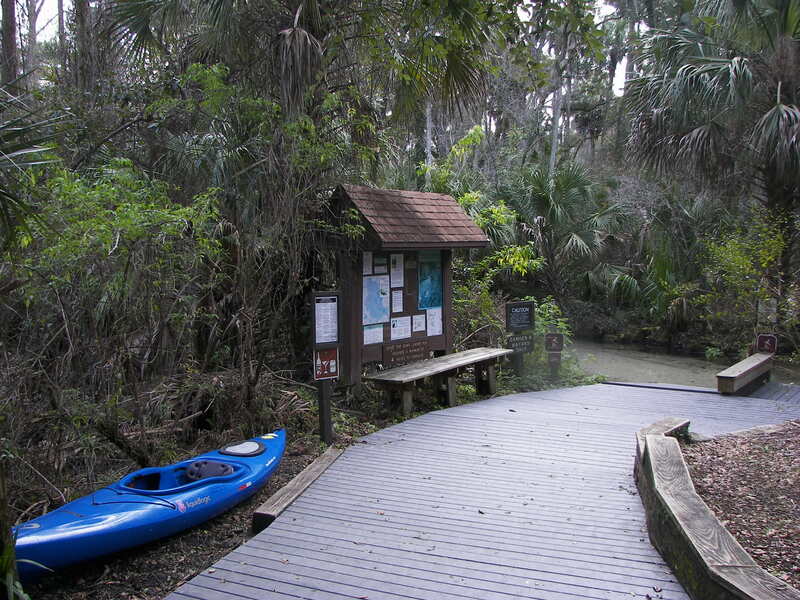 and places further along the way (if you had a kayak on top of your car) to check out. 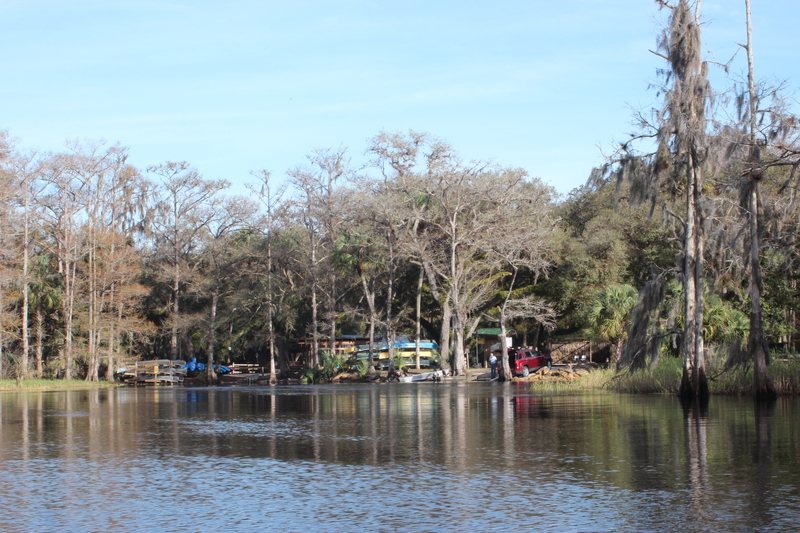 so I did -this was the Santa Fe River – and I really did check-out some other neat places but I’m just too tired to write about them now…. 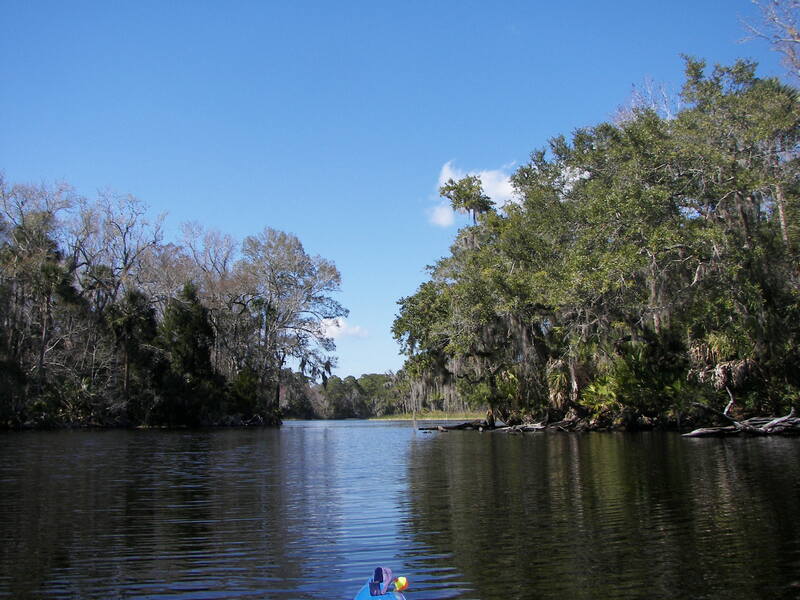 plus I checked out the place where my Cousin JoAnne and I will paddle tomorrow (The Silver River/Springs), it will be a chore upstream – but a nice ride back,,,,, more later.